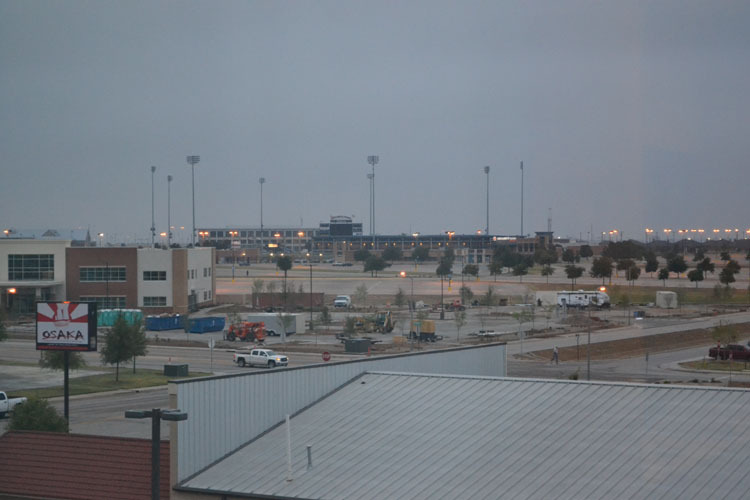 When I woke up early on the morning of May 21, my first mission was to run to my balcony and check out the view of Dr Pepper Ballpark like a kid charging downstairs on Christmas morning to see if Santa came. 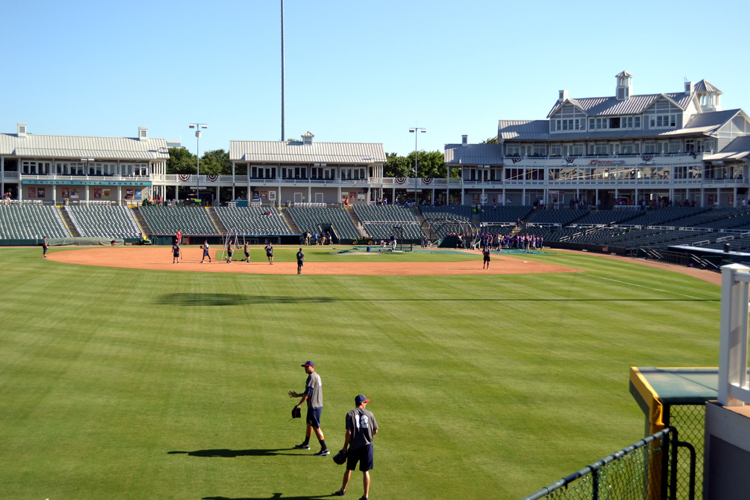 Yep, the ballpark was still there, as expected, and it still looked great. 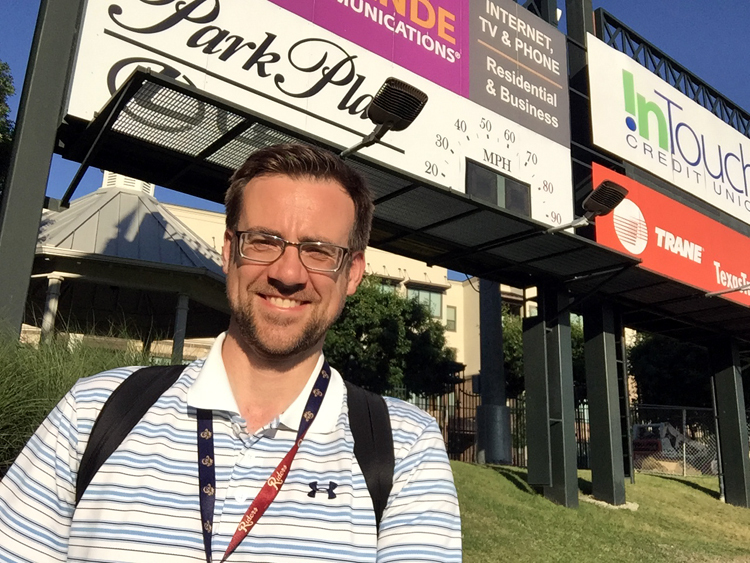 Next, it was time to excitedly think about returning to the ballpark — where I’d spent an awesome evening a day earlier — later that day. 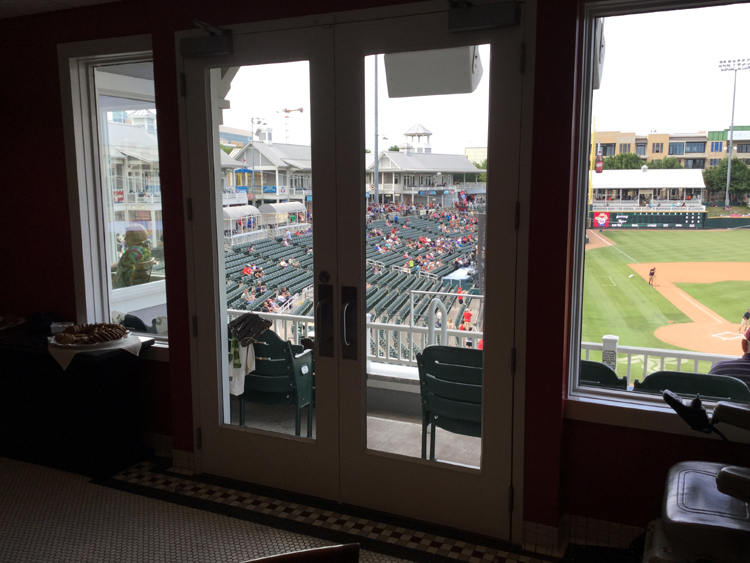 Filling my stomach in the exclusive JC Penney Club, thanks to an invitation from Jason Dambach, executive VP and general manager of the Frisco RoughRiders. Feeling butterflies in my stomach being interviewed during the team’s broadcast. 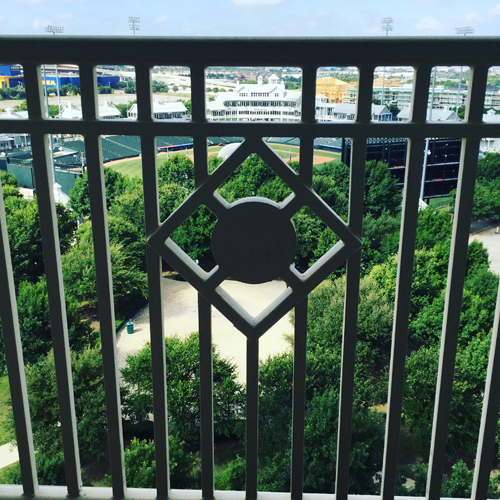 After a big, delicious breakfast at my hotel, the Embassy Suites Hotel and Convention Center, I settled down at the desk with my laptop to catch up on a little blogging … but I’d also intermittently go out to the balcony, sit on the chair and just take in the beautiful view in front of me. This was the pattern for the bulk of the day, and pretty soon it was time to pack up my stuff and walk over to the ballpark. I walked through the gates early so that I could shoot a bunch of video with my GoPro, which you’ll be able to see on my YouTube channel in the future. 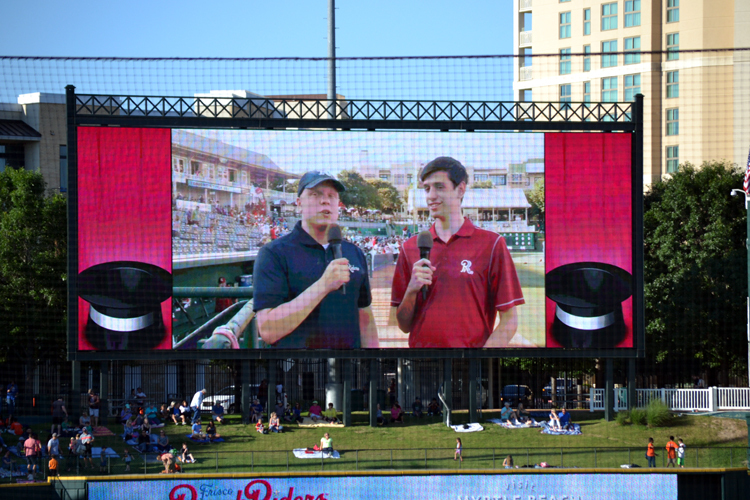 Let me explain the context: A day earlier, I’d met Jason and we’d talked about my baseball trip, Dr Pepper Ballpark and bunch of other cool things. The topic of food came up, and I’d excitedly told him about my plan to eat the Texas Mac & Cheese BBQ Sandwich. 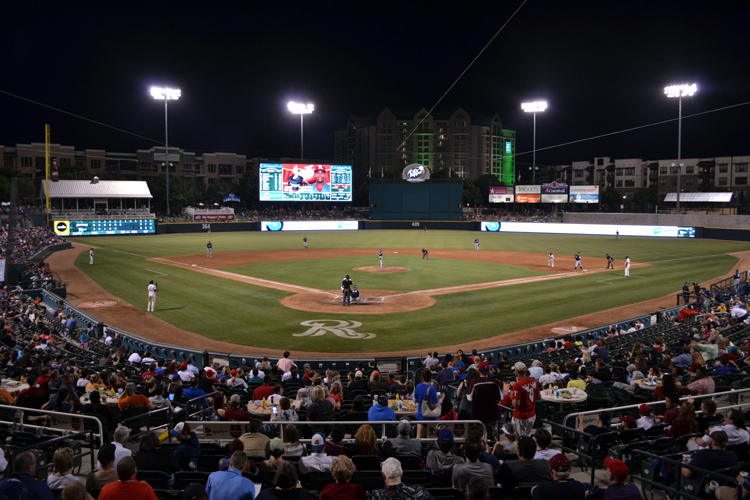 He mentioned the JC Penney Club, an upscale eatery with a great view of the ballpark, and told me that I’d be hard-pressed to find better food in all of the minor leagues — and then told me that he’d make me a reservation to eat there before the RoughRiders game a day later. Wow! 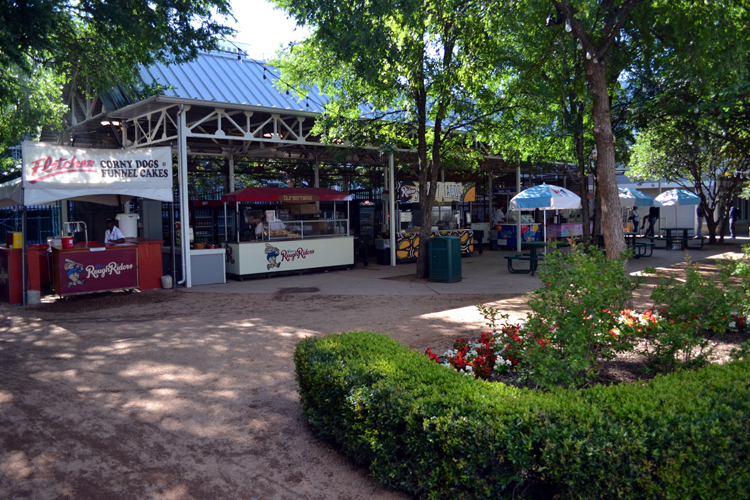 I was scheduled to eat at 5 p.m., and had about an hour to continue to explore the park before then; I wanted to do lots of walking around, as I suspected I might be a little sedentary after experiencing the buffet-style dining. 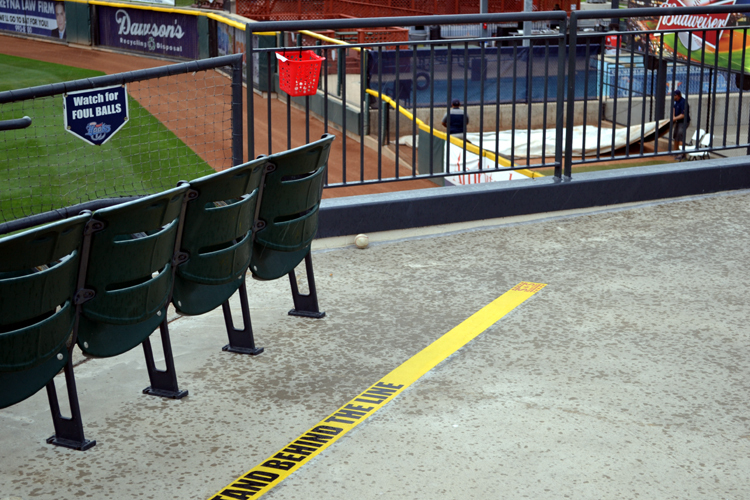 See the baseball right below the rail? 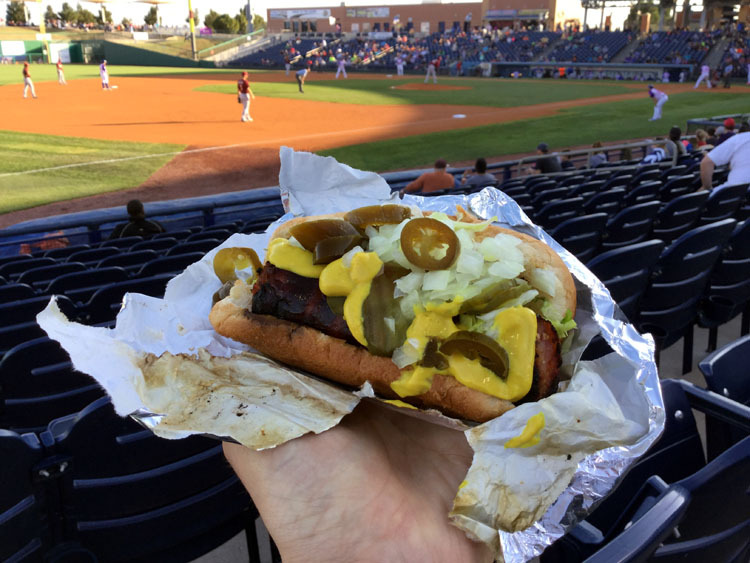 There were also several salads — let’s be honest, I wasn’t going to focus much on them — and some traditional ballpark fare that seemed favored by the kids who were dining at the same time as me. When I stepped up to the buffet for the first time and asked for a slice of the beef, the server asked, “Just one? You’ll be back for sure.” And then, a bit later when I did indeed return, he offered, “I told you that you’d be back,” with a smile. 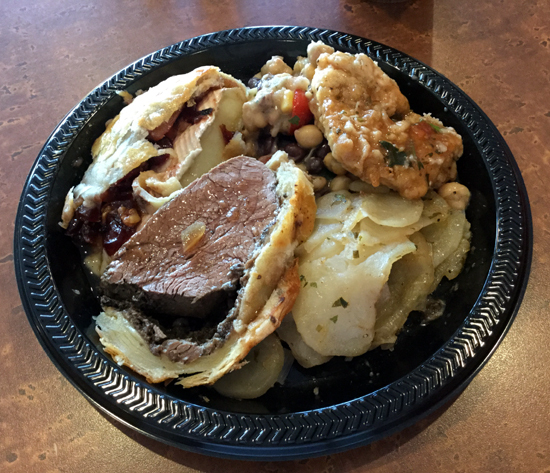 You’re looking at more beef Wellington, baked brief, pan-seared chicken and, this time, some of the Lyonnais potatoes and a bit of chick pea salad, too. 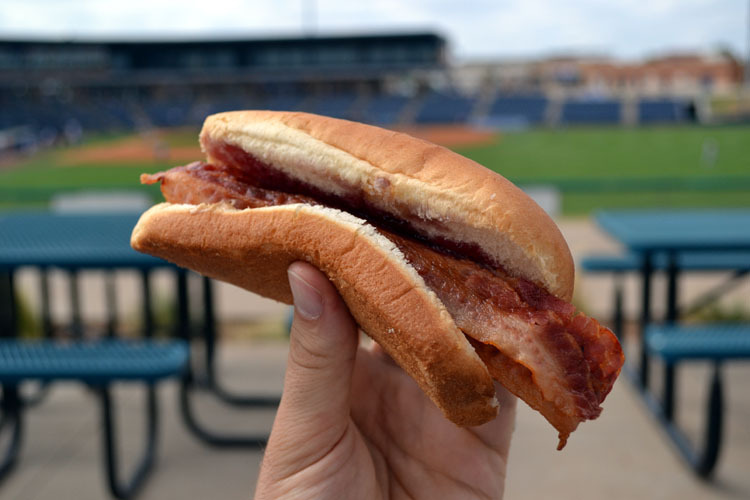 I can definitely say that the meal was one of the best I’ve ever eaten at a ballpark, and the tremendous quality of the food was as good as you’d find in a fancy restaurant. 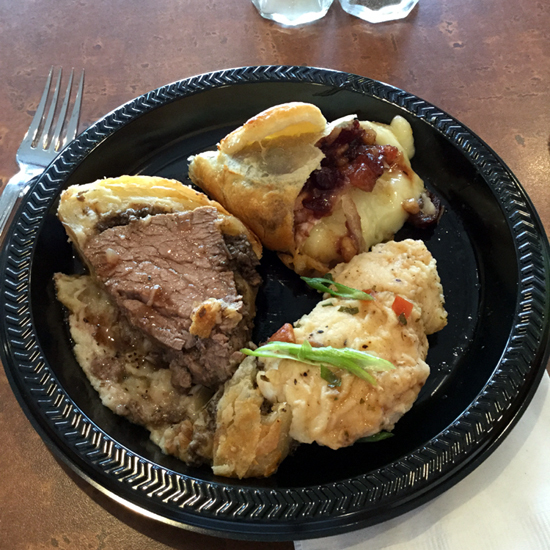 If you get the chance to eat at the JC Penney Club, make sure that you go for it! 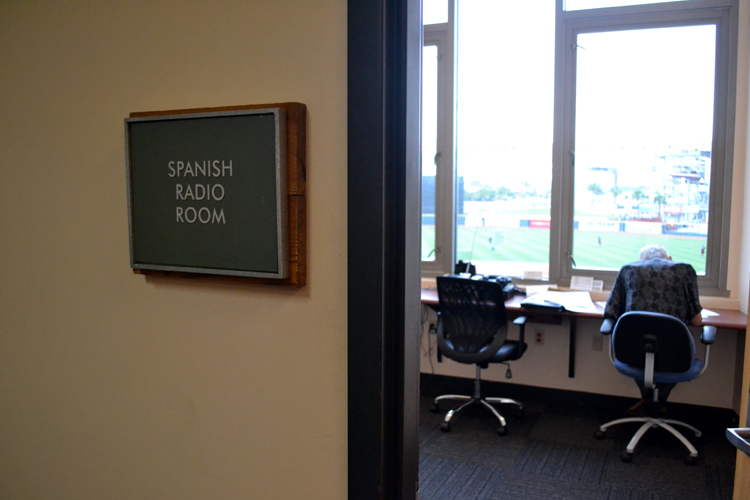 After a couple of innings in that spot, it was time to make my way toward the press box, as I was slated to join the broadcast in the top of the fourth inning. As I said earlier, I had a few butterflies in my stomach, which is always the case when I’m interviewed on the air. This time, though, I wasn’t as nervous because I’d had a chance to talk to the broadcast guys during a quick visit before the game. They were all super down to earth and fun to talk to, and we exchanged lots of baseball stories. 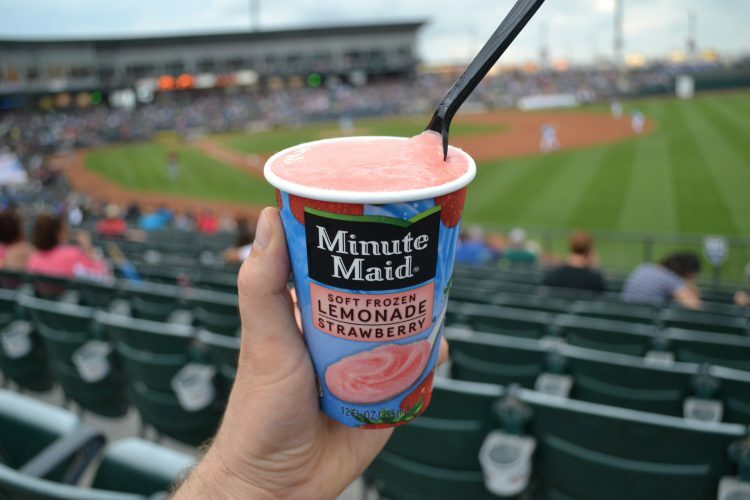 They even asked me to name my best ballpark adventure story, which was an easy one to answer. 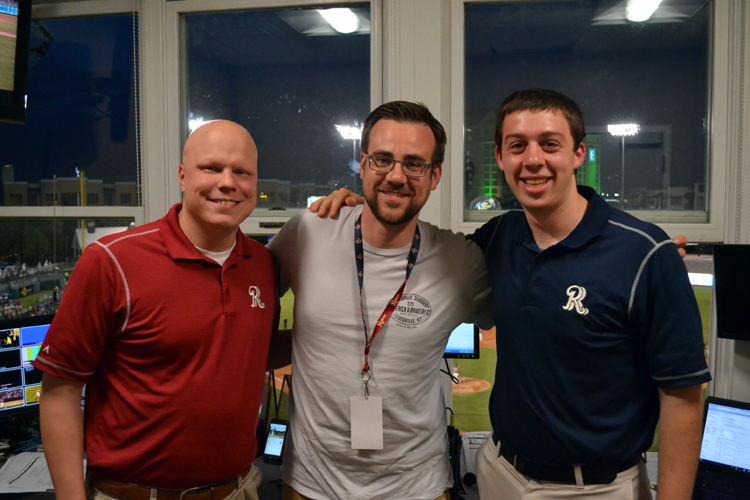 By the way, give the RoughRiders broadcast team a follow on Twitter, and check out a broadcast online, too. These guys are great. 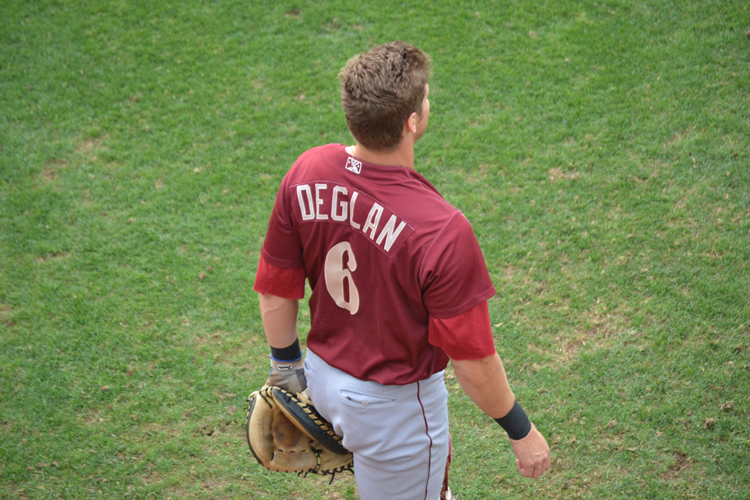 … and then grabbed a spot behind home plate to watch the remainder of the game, which seemed to fly by quickly. 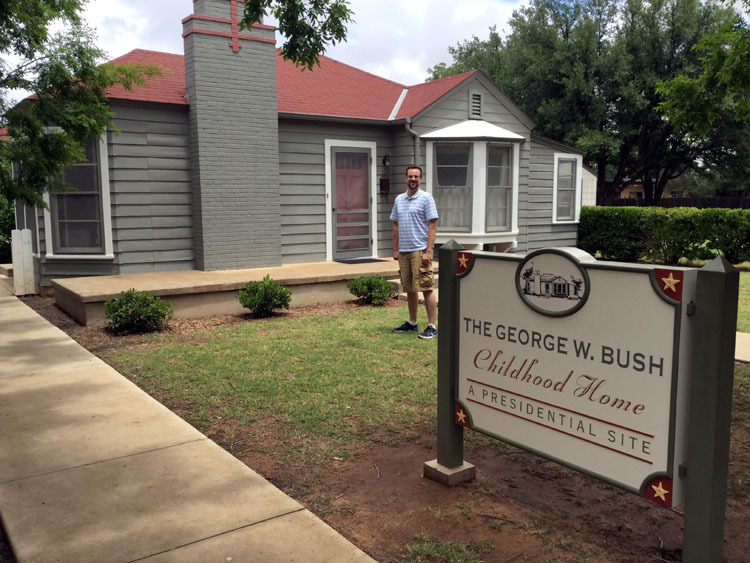 Each passing inning meant that my Texas trip was coming to an end, but I was grateful for all the wonderful memories I made, the great people I met and the help of all those who contributed to the adventure. 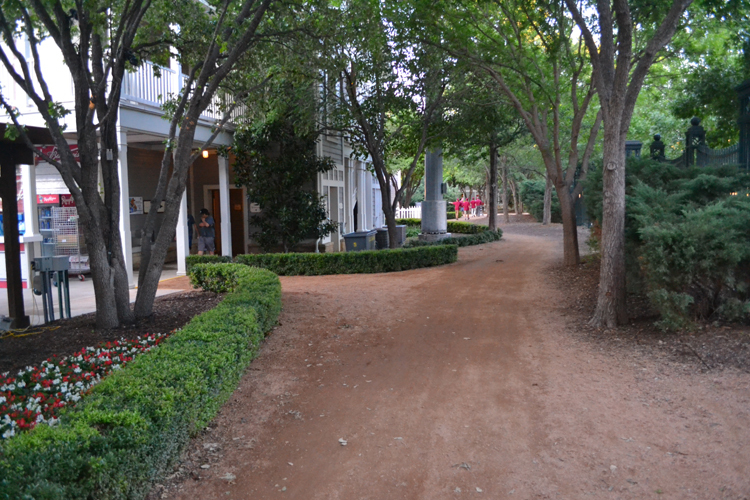 I’m certainly looking forward to returning to the Lone Star State again soon. So long, Texas. I hope to see you soon again. 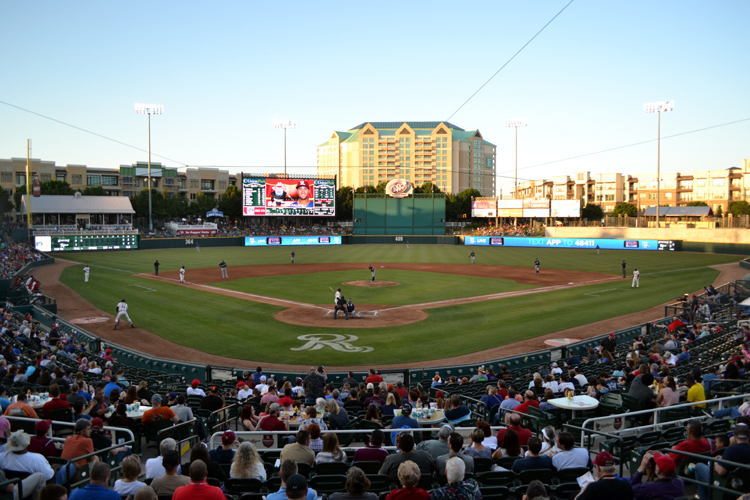 The final days of a baseball road trip can be a little challenging — sometimes, I simply don’t want the trip to end. Other times, I’m exhausted and admittedly ready to get home and resume a normal schedule that includes sleeping and eating vegetables. 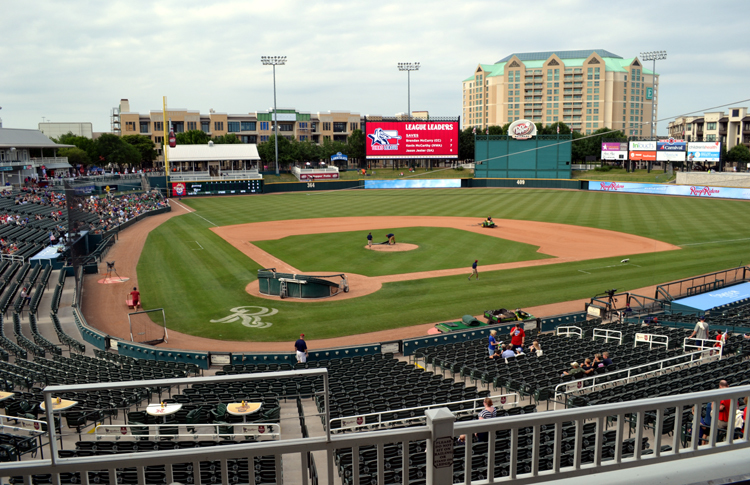 Fortunately, that wouldn’t be the case on days nine and 10 of my Texas trip — I was thrilled to visit Frisco and see the RoughRiders for a pair of games. 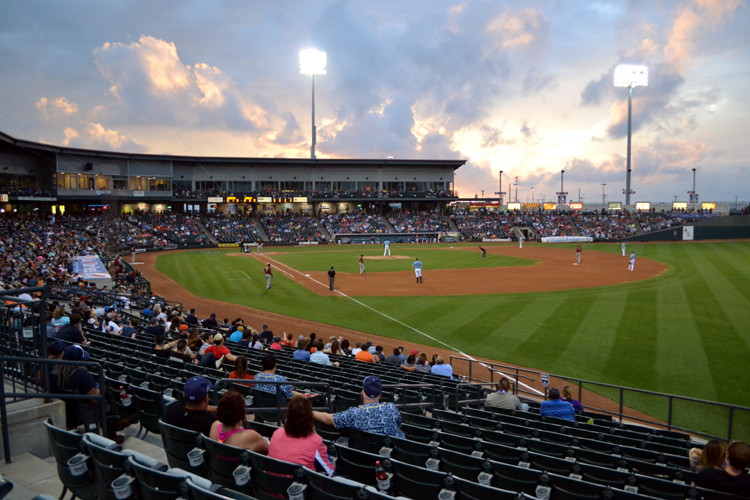 Frisco is located just north of Dallas, and is about a five-hour drive from Midland, where I’d spent May 18 and 19 seeing the RockHounds in action. 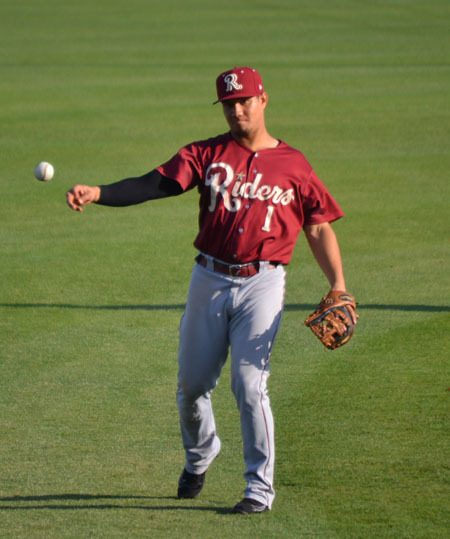 Although the RoughRiders were playing an evening game, I was anxious to make the drive east through Texas and get to my hotel for an early check-in. 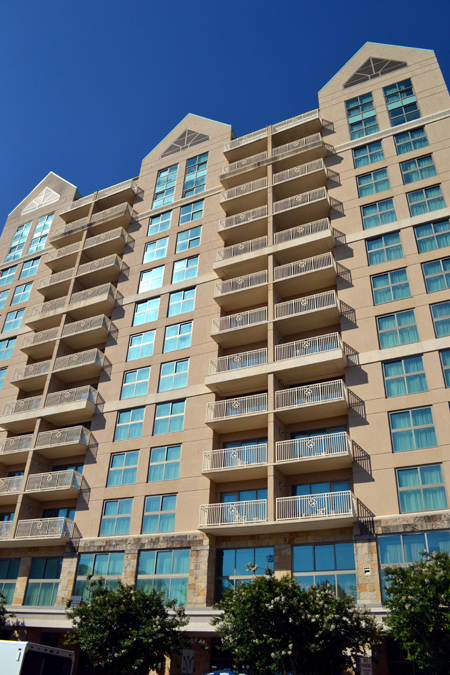 It’s an understatement to say that I was excited to experience my hotel, the Embassy Suites Hotel and Convention Center. 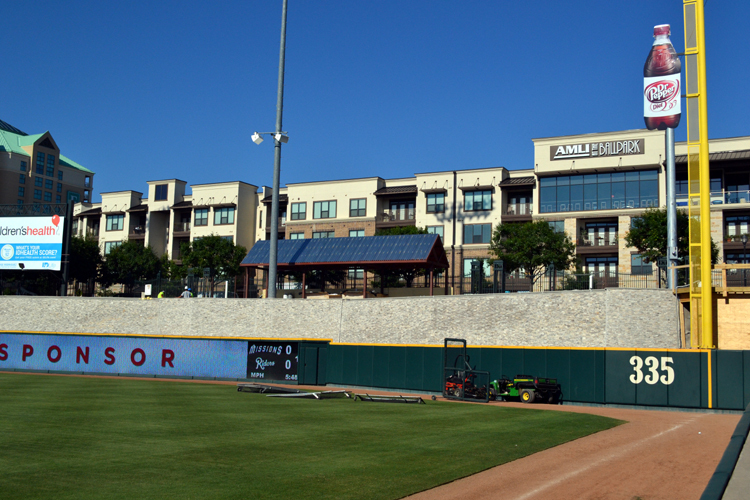 That’s because — in addition to looking very impressive online — it is located directly beyond the outfield of Frisco’s Dr Pepper Ballpark, meaning I’d once again be fortunate to visit a hotel with a field-facing room. I pulled into the hotel’s parking lot just after 3 p.m., hurriedly unloaded my backpack and suitcase and checked in quickly. I remember being amused at myself as I walked with a profound sense of purpose through the hotel lobby to the elevator, and then from the elevator to my room, as I was pumped to see what the view was like. Well, it certainly exceeded my expectations! 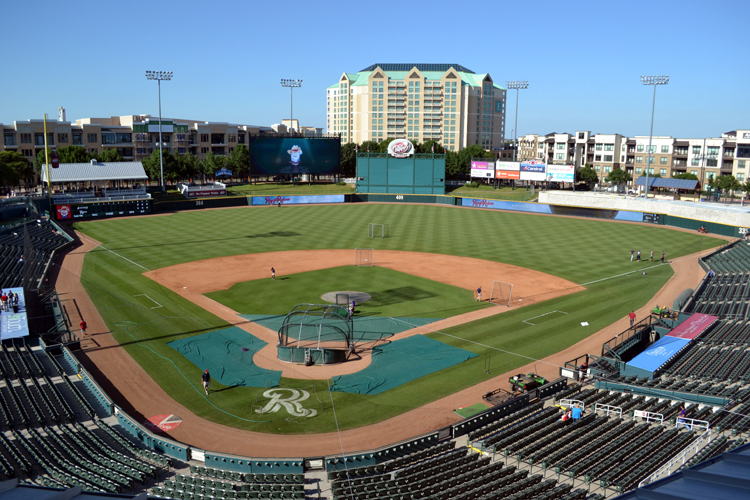 What a great looking ballpark, eh? 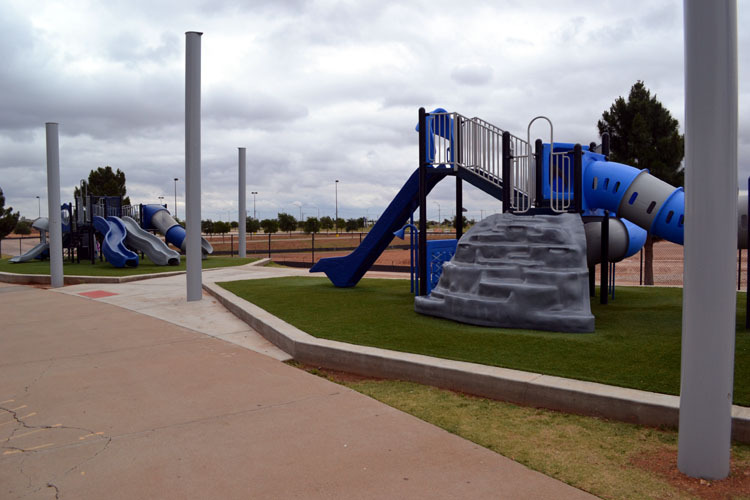 I instantly loved the unique structure of the park — instead of the standard look that I’ve often seen around the minors, this park was visually engaging because of the smaller structures around the concourse, instead of one larger building. 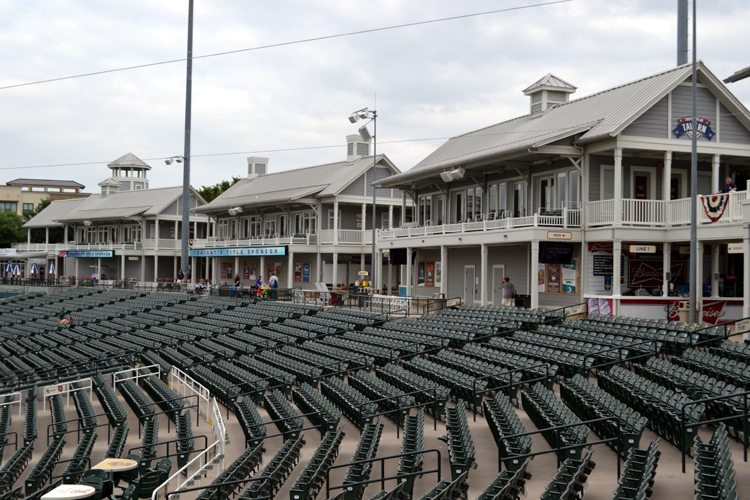 Like other parks, Dr Pepper Ballpark has a number of concession stands around the concourse and suites above, but I think it’s neat how it’s not all one continuous structure. 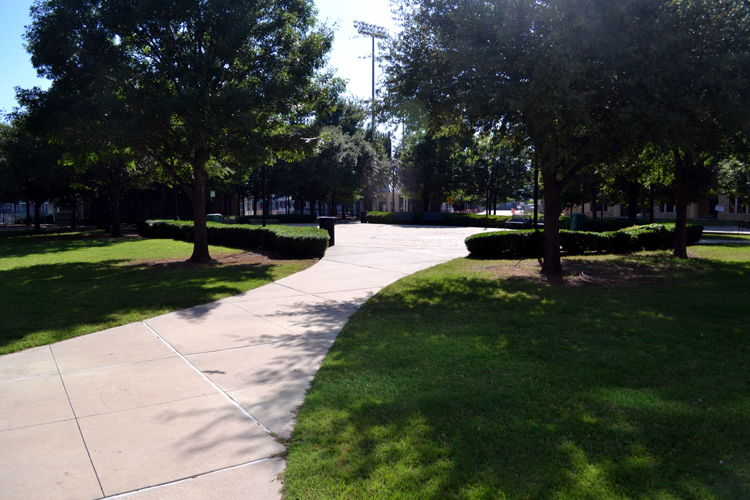 The little walkways between the buildings, I’d soon find out, make getting around this ballpark really easy and fun. 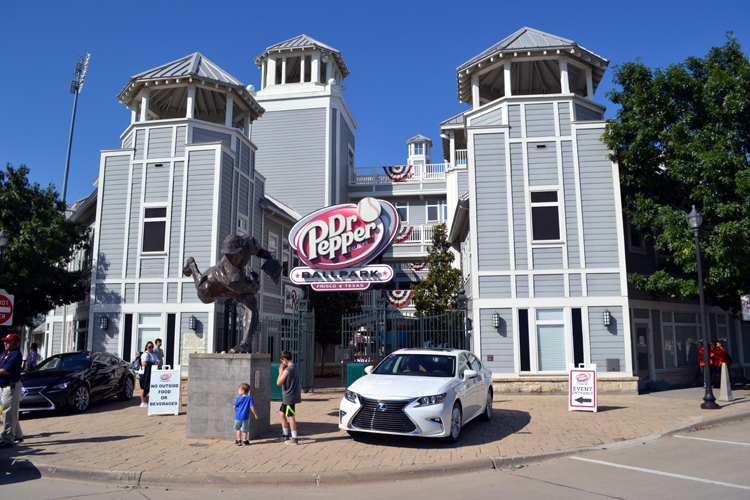 The only thing that troubled me about the glorious sight in front of my eyes was the way the trees were overgrown and partially covered the Dr Pepper Ballpark sign. I realize this is a first-world problem, but I think it’d be nicer if the sign were fully visible to people in the hotel. 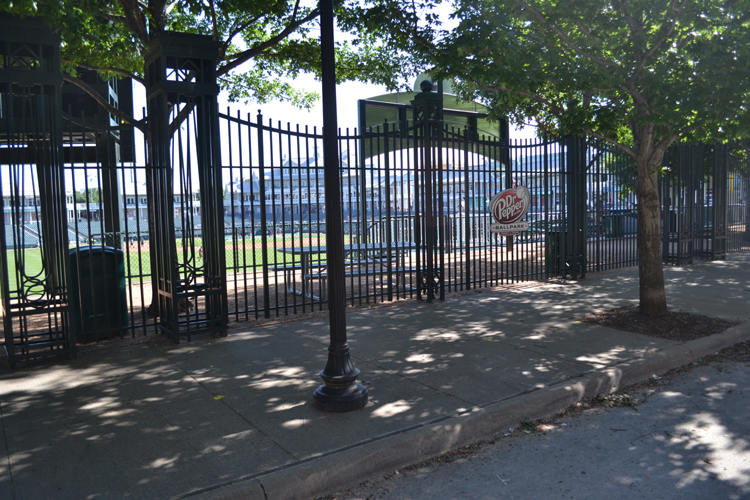 As you might have seen in the above photo, the batting cage was set up and the players were hitting, but I didn’t want to get to the park just yet, as I’d skipped lunch and was starving. I made a quick run across the street (heading in the opposite direction from the ballpark) to the Stonebriar Centre mall to grab a quick lunch from the food court. 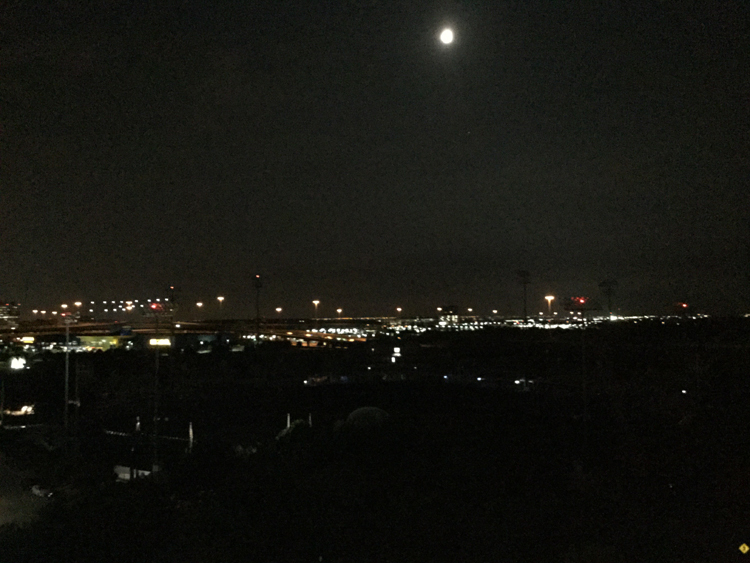 As you might suspect, I brought the food back to enjoy eating it with the great view from my balcony. I love when hotels think of small details like that. 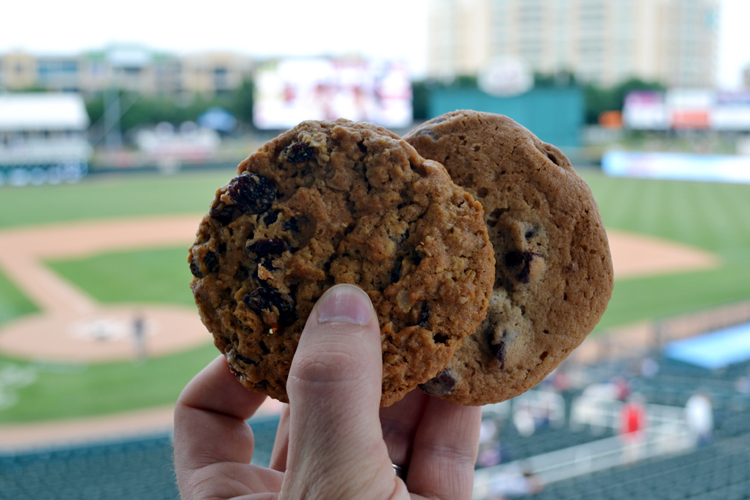 Once I finished eating, I checked out a generous gift basket that the people at Visit Frisco had left me. 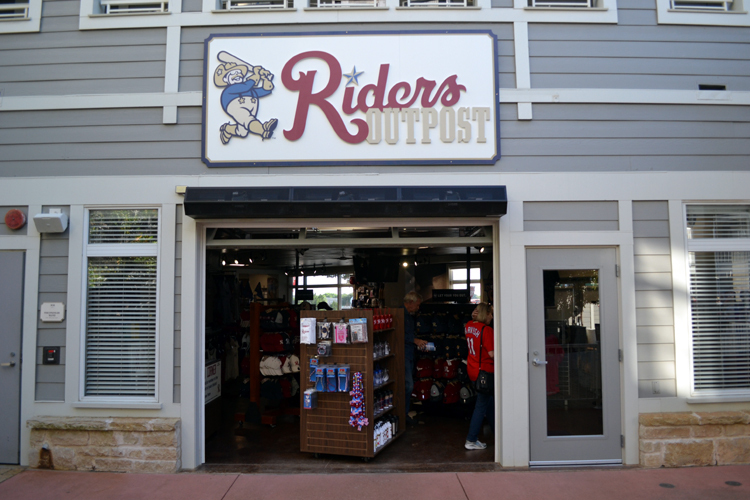 They were instrumental in setting up my visit, and surprised me with a bunch of goodies, including a RoughRiders cap and towel and some other sports gear from the local area’s teams — a Dallas Cowboys pin and a Dallas FC scarf, as well as some other awesome treats. 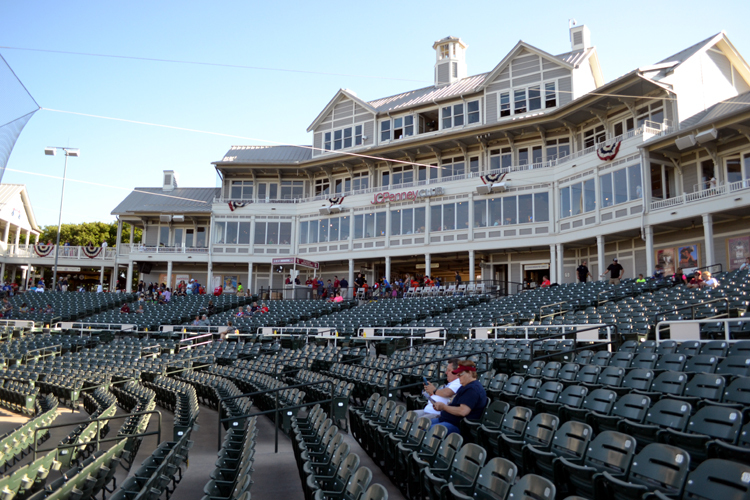 Again, you’ll see that this park has a unique look, with a series of individual building sections (and turrets, of course) that make the home of the RoughRiders unlike any other MiLB park I’ve seen. 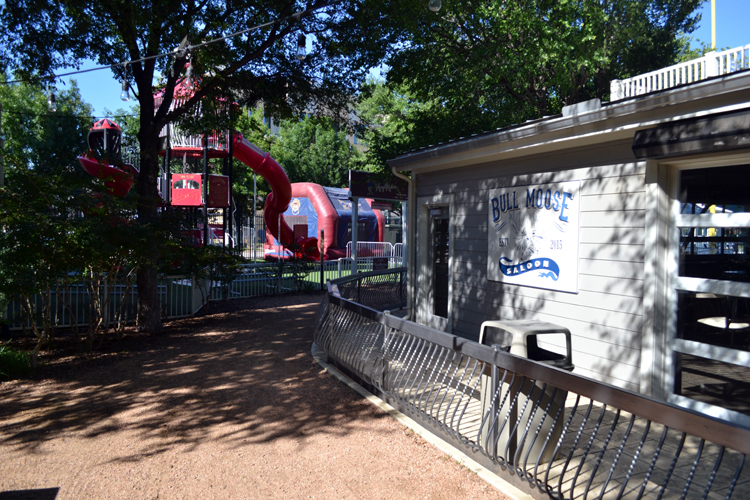 Yes, there’s a huge kids’ play area ahead and a bar/eatery on the right side, but check out the gravel walkway! And the trees! It felt like I was in cottage country or at a campground. 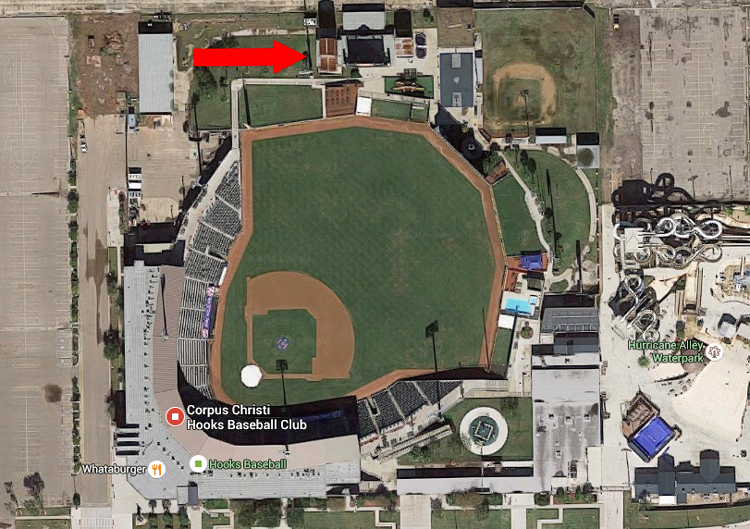 Now, make no mistake — there is a traditional concrete concourse at Dr Pepper Ballpark, but behind the buildings that line the concourse, you’re treated to this campground/neighborhood feel, and it’s outstanding. 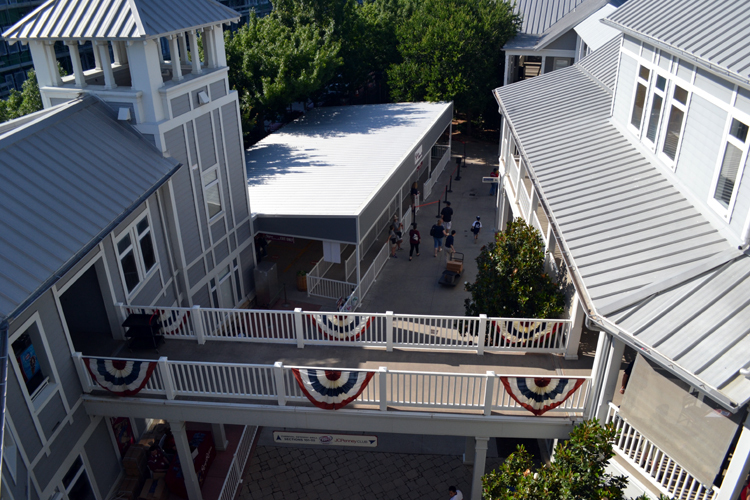 And the structure you see in the background is the batting cage area, so you can watch players taking some pregame cuts while you wait for your food. How perfect is this setup? 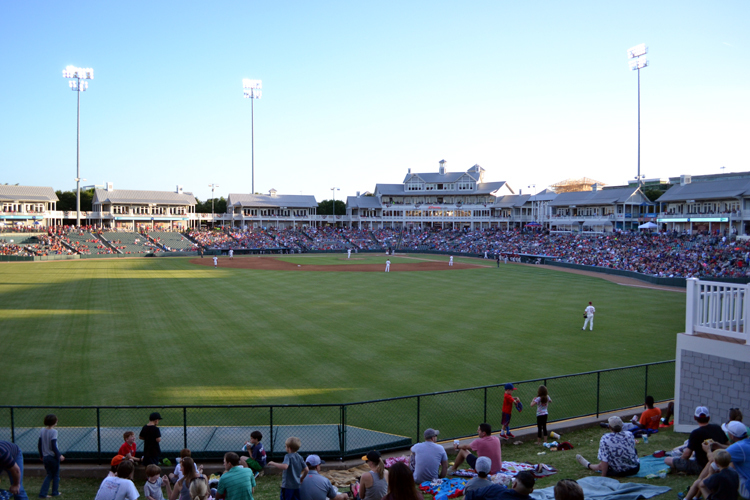 Being away from home, traveling every day or two and often being in crowded environments can feel a little hectic, so it was comforting to be able to take a walk through the quieter areas of Dr Pepper Ballpark whenever the feeling suited, and I certainly encourage you to try it, too. 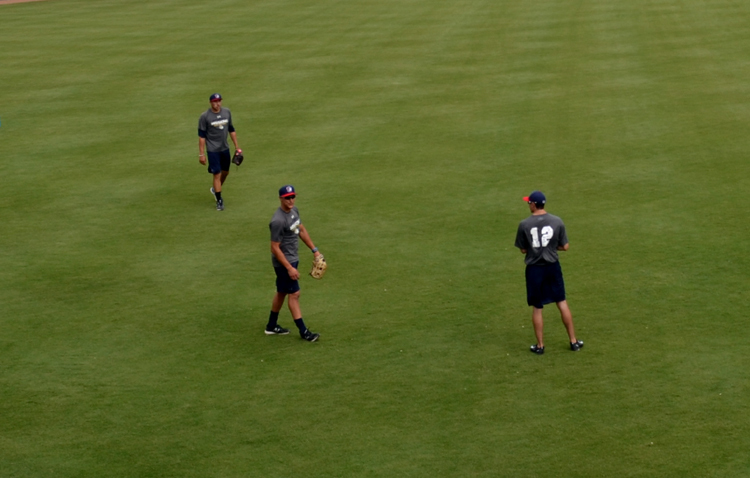 … and stood to watch batting practice for a few minutes. 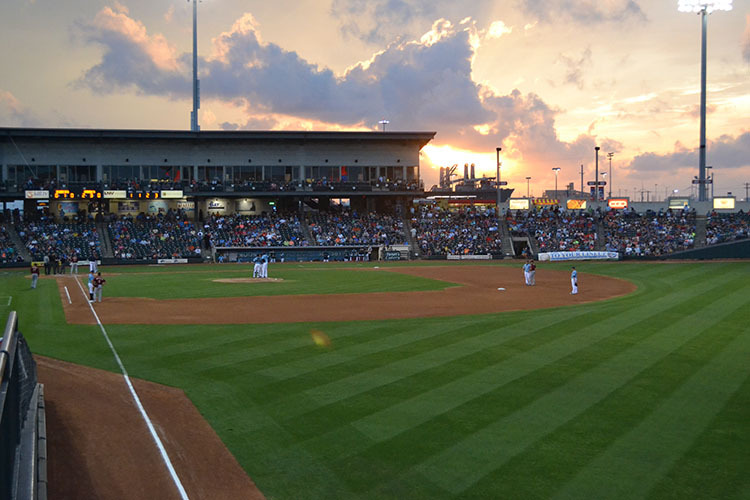 Having been to 62 major and minor league ballparks, I’ve seen a lot of great views from behind home plate, and this one is right up there. Don’t you agree? 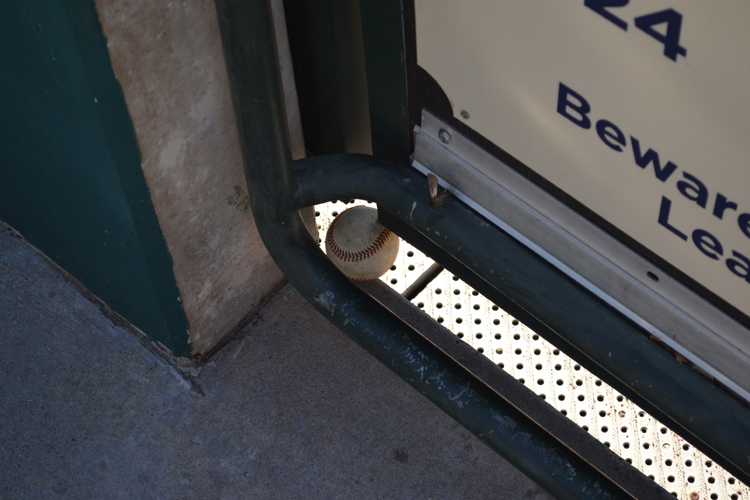 As you can see, the ball was jammed under one of the doors leading out to the field. My “no baseballs before gates open” rule kept me from grabbing it, but I vowed to return after the gates had opened up, to see if it was still there. What a cool feature! 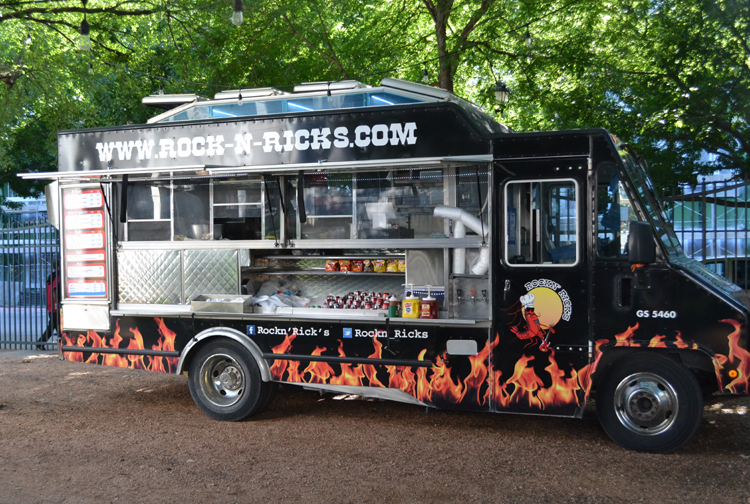 Food trucks arrive on game day, park inside the ballpark and then leave at the game’s conclusion. 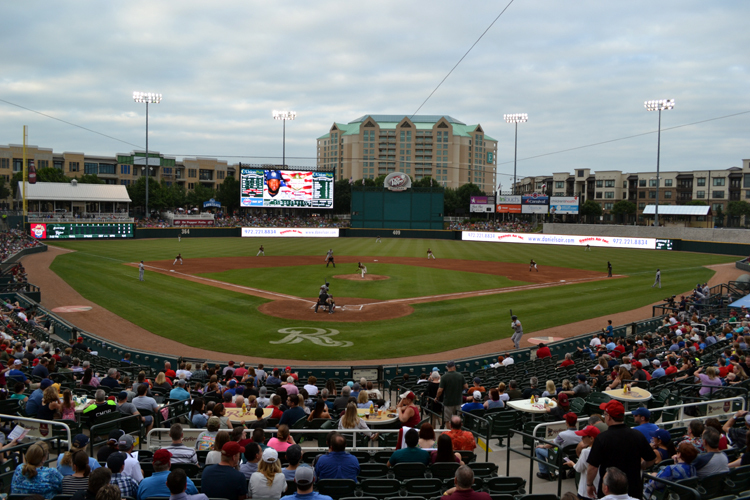 I’ve often seen food trucks outside ballparks — especially in the majors — but I can’t recall seeing one inside a park; just another creative thing that the RoughRiders do very well. 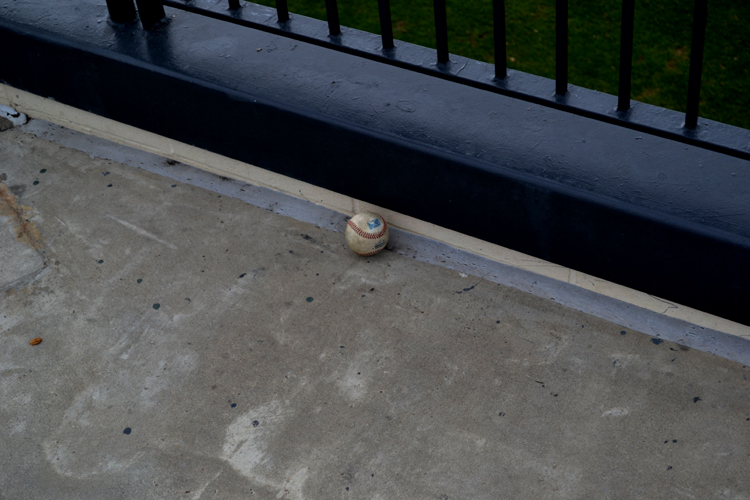 I stood at one of the press box windows and took everything in, allowing my eyes to slowly pan from left to right, and then it hit me — the baseball that was hiding under the gate! 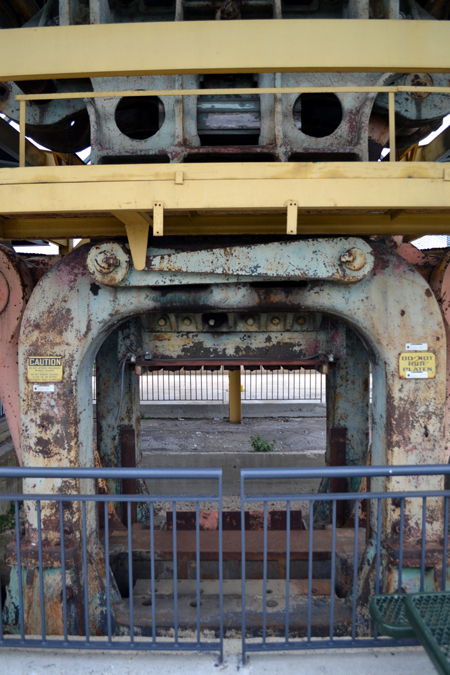 I’d been so enjoying all the sights that I’d forgotten to check for the ball after the gates had opened. 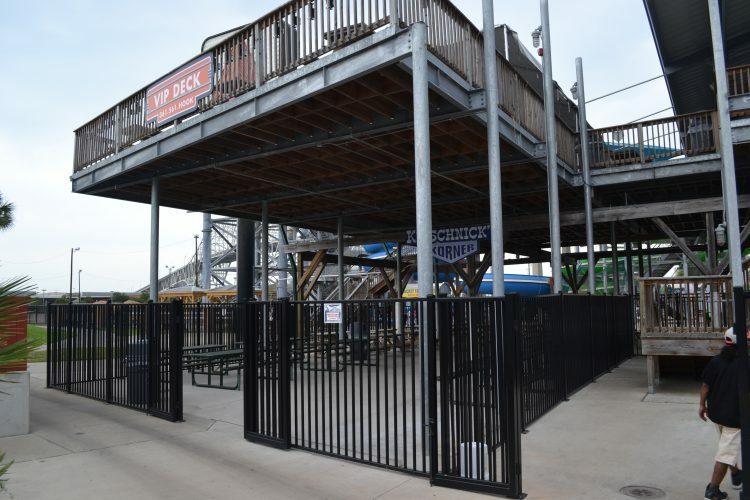 By now, the gates had been open about 20 minutes, and while there were lots of fans in the park, most of them were congregating around the concourse and concession stands. 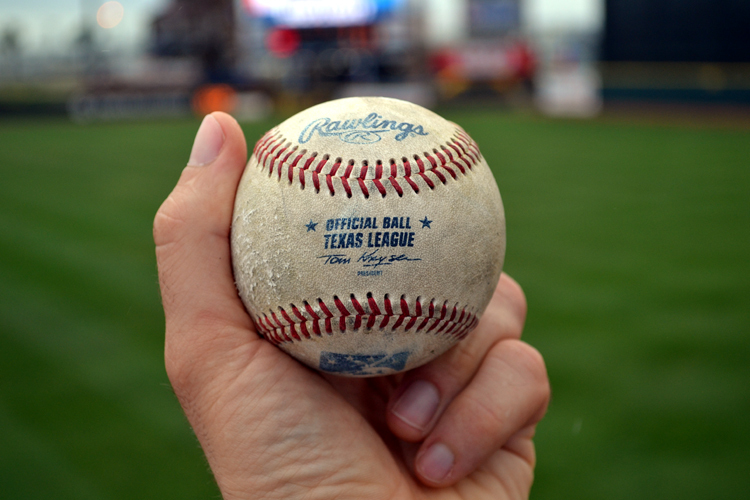 This meant that there was an outside chance of the ball still being there, so I hustled down to the concourse, made my way toward the right field corner and … voila! Above five minutes after grabbing the ball, I was leaning against the railing and enjoying the view, when a young family (parents and a boy about five) approached and asked me to take their photo. They descended a couple steps in front of me and I snapped a few shots with their iPhone. As I went to give the phone back, I pulled the ball out of my pocket and handed it to the kid, whose jaw dropped enough that the ball might’ve fit in his mouth. As much as I love collecting balls for myself, it’s sure a thrill to give them away, too. 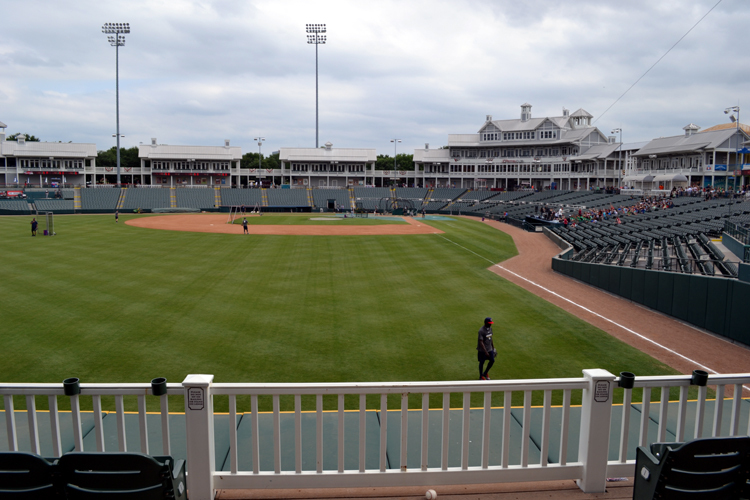 Speaking of thrills, my next stop at Dr Pepper Ballpark was to see one of the most unique sights I’ve ever seen at any park, MLB or MiLB. 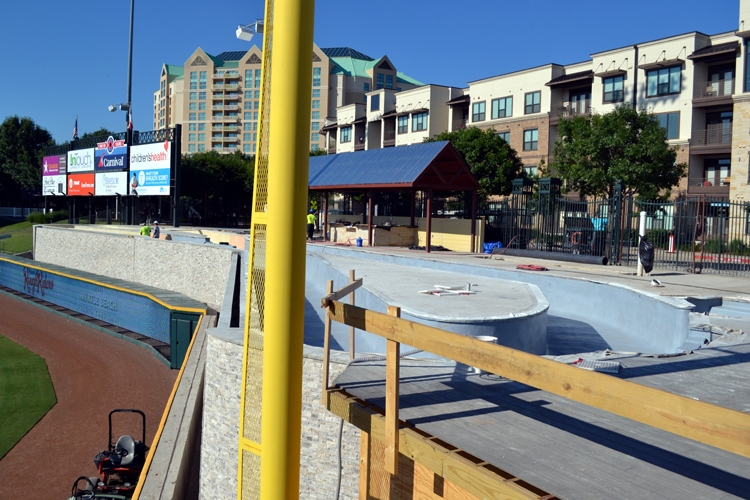 In case you haven’t heard, the RoughRiders have installed a lazy river beyond the right field fence! 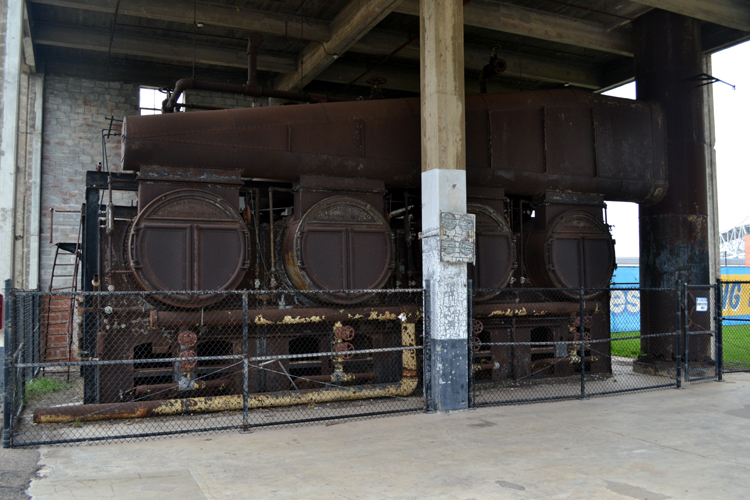 It wasn’t complete when I visited, unfortunately — I guess I’ll just have to make a point of visiting again to check it out — but I was able to take a look at it and snap some photos. Lazy rivers are my absolute favorite attraction at water parks. You can keep your slides and wave pools; give me a lazy river and I’ll happily float around for hours. 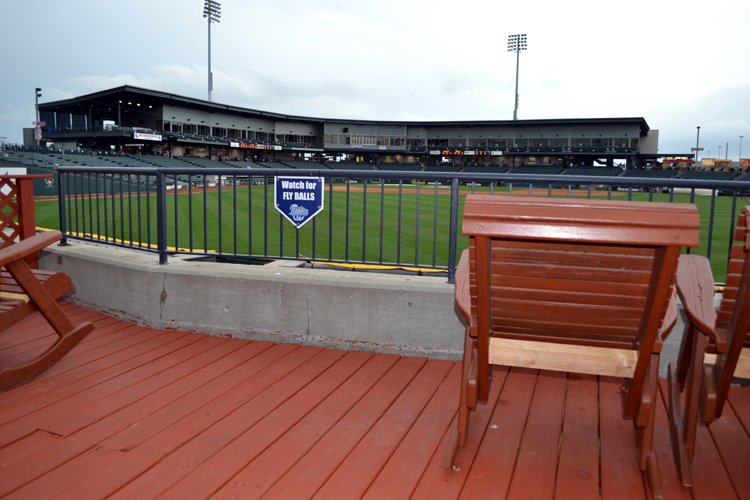 Can you imagine how cool it would be to watch a minor league game from this vantage point? Hmm, I really need to return to Frisco, don’t I? 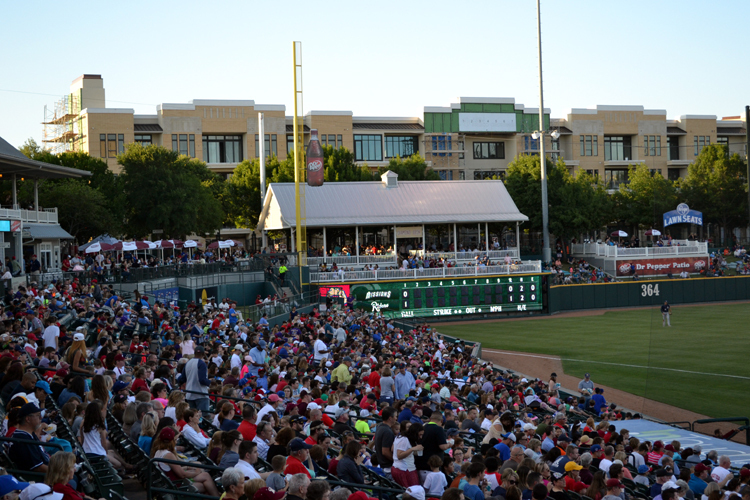 As seems to be the theme at Dr Pepper Ballpark, this building is different than virtually everything else I’ve seen during my travels. 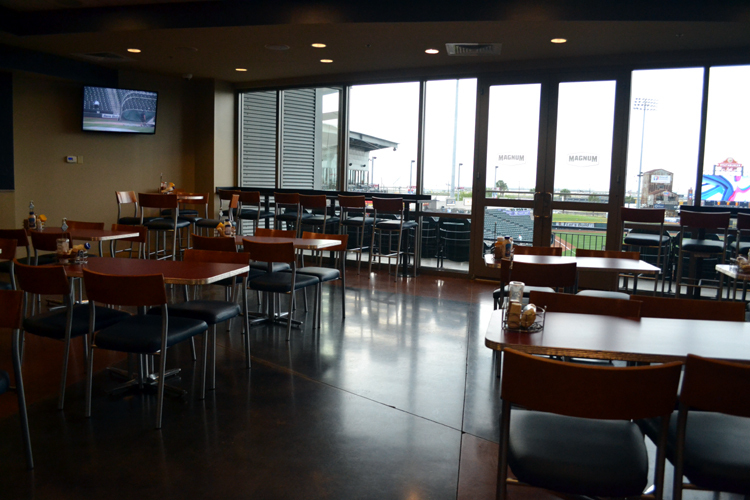 On the concourse level, there’s a large open area where fans congregate during games. 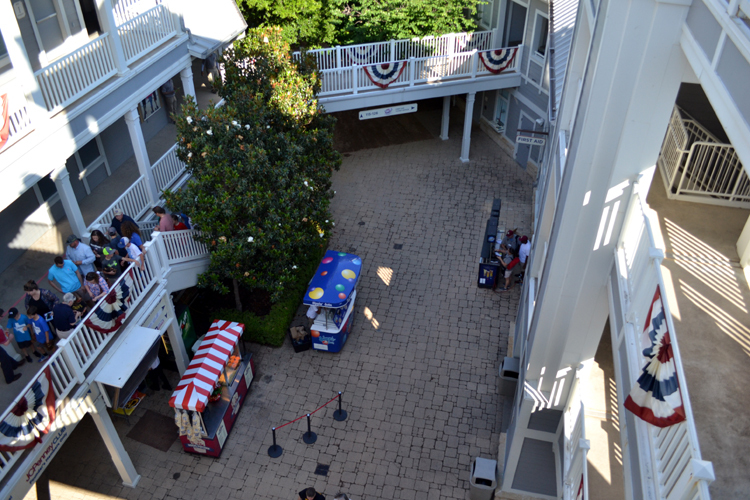 The second level is the JC Penney Club, an upscale eatery that I had the fortune of experiencing on the second day of my visit — and you’ll want to make sure that you read that blog post. 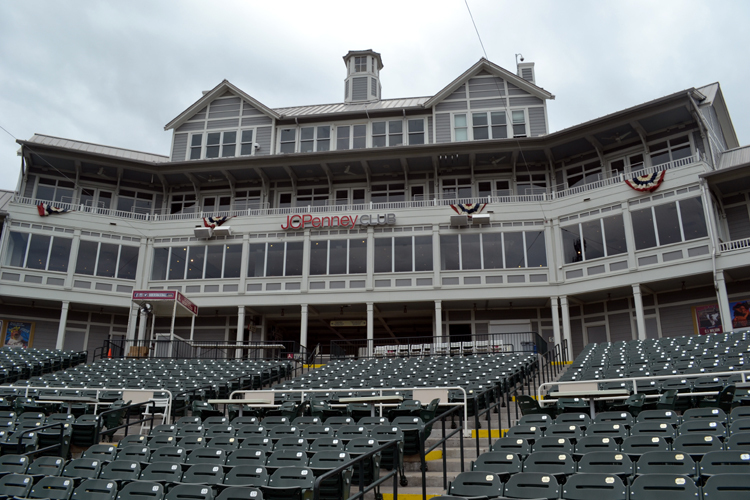 The third level is made of suites and way up on the fourth level is the press box. Also, how awesome does this building look? 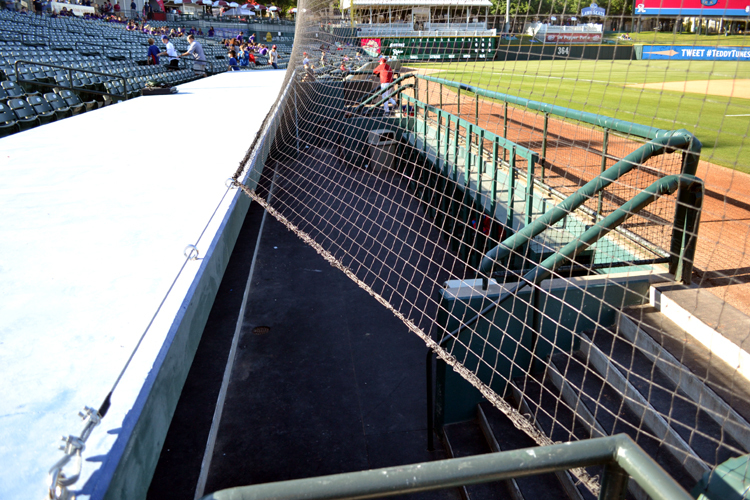 I don’t know the specific reason for the inclusion of this opening, but if it was to give fans a chance to get pregame autographs from players, I give a big-time kudos to the RoughRiders for creating a fan-friendly element to the netting. 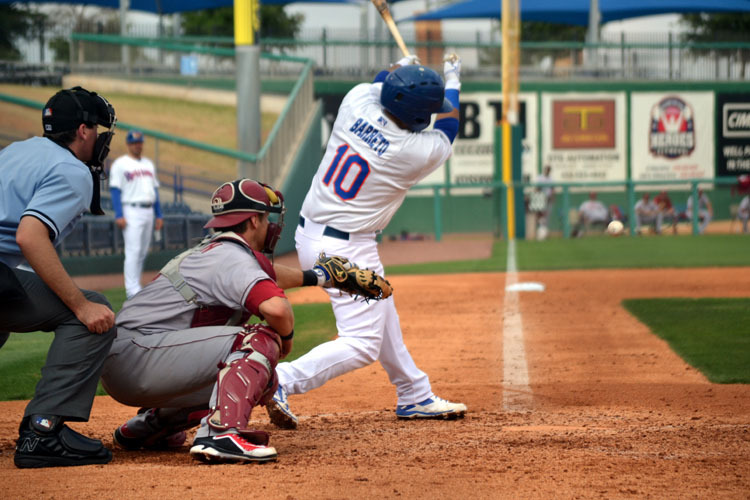 This is another thing that’s awesome about the minor leagues. When a MLBer signs in a designated area before a big league game, it’s pandemonium. In the minors, countless fans were passing by the autograph area without making a fuss. Some were exchanging greetings with Payano, others were shaking his hand and others were completely oblivious. As a fan, the idea of running up and grabbing an autograph and a photo without having to dedicate an hour to the process is truly welcome. This was significant because I was scheduled to join the live broadcast to talk about my Texas trip, blog and website a day later. 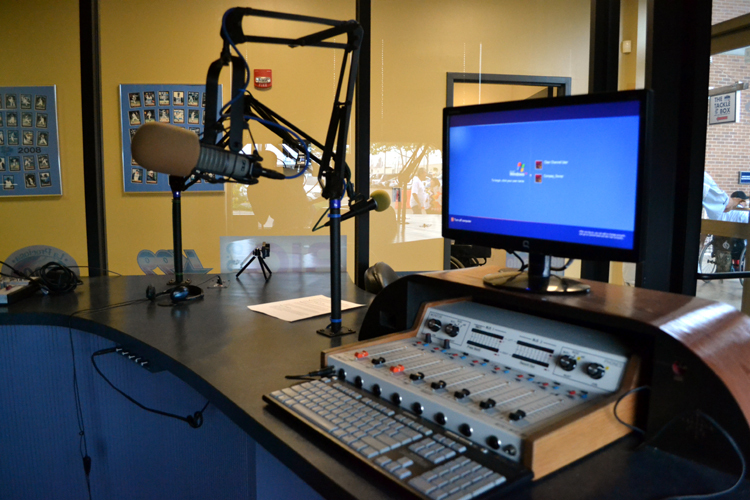 I’ve been interviewed on the air in several different cities, and it never fails to be a huge thrill … and something that’s a initially a bit nerve-wracking, too. So, seeing and listening to the guys in advance of joining them on the broadcast helped me to relax a little. About this time, I got the chance to meet up with Jason Dambach, the executive VP and general manager of the team. 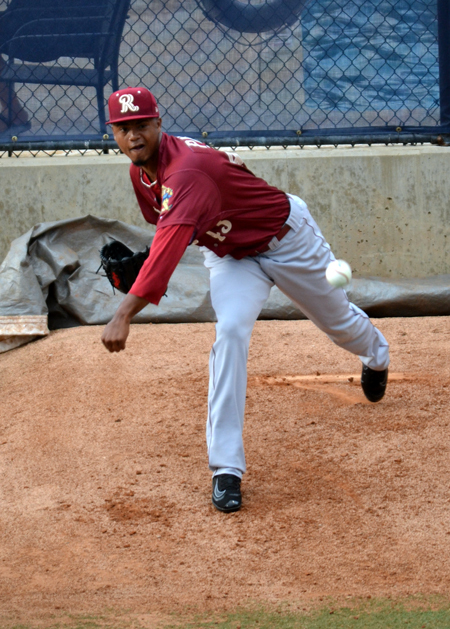 (And the president of the State College Spikes, too!) He’d tweeted at me before the game and we’d agreed to meet up, and it was great to get a chance to tell him about my travels and hear some details about the ballpark, too. 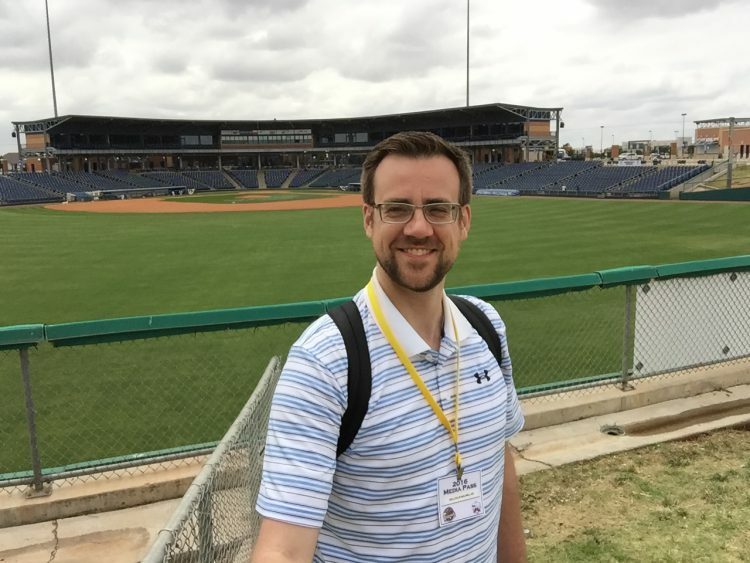 One of the best things about visiting so many ballparks is the opportunity to chat with friendly baseball people, and Jason certainly fits that description to a T. I’m looking forward to crossing paths with him again somewhere down the line. 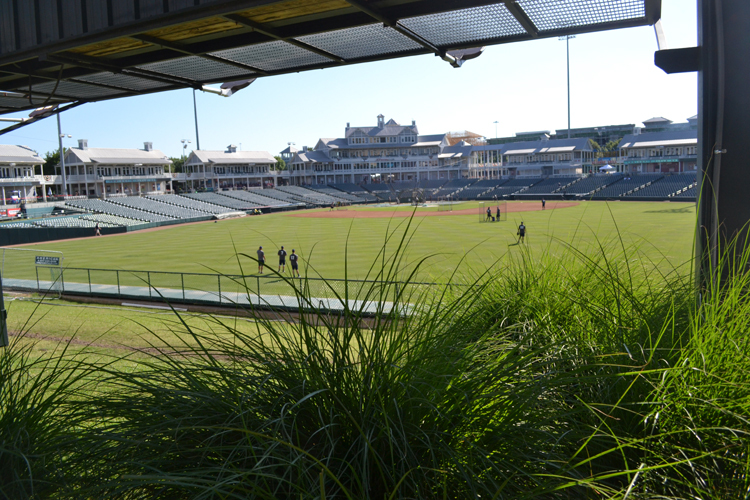 I watched a little bit of the action from the berm, and then headed over to the Frisco bullpen down the first base line. 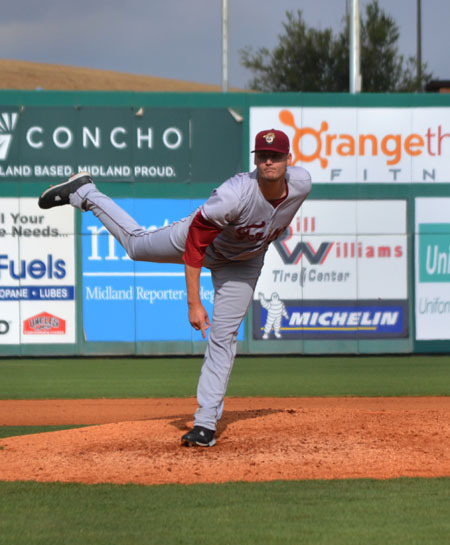 In general, most bullpens in the minors are set up in a way that gives fans outstanding access, whether it’s to get an autograph before the game, ask for a ball or, as I enjoy, just standing next to the bullpen and taking in everything. 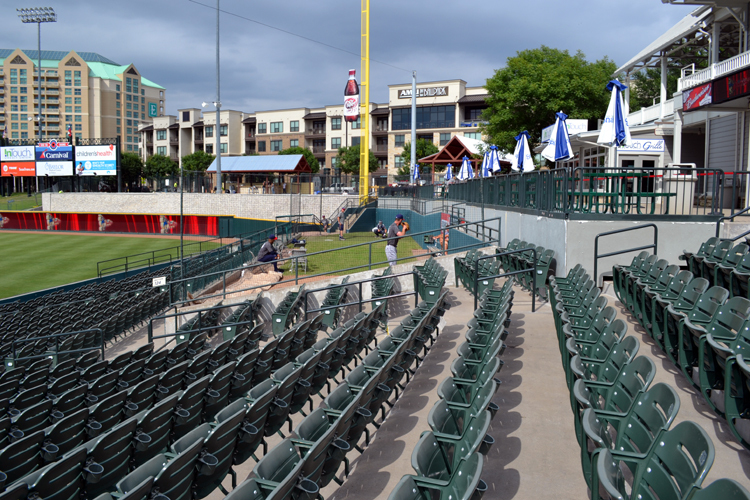 The Frisco dugout is actually situated between different seating sections. 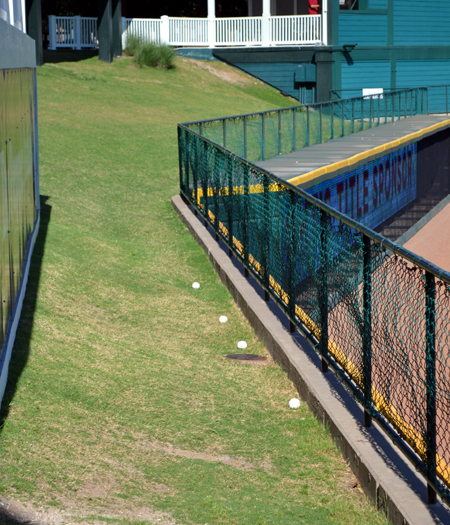 This means that you can stand next to the bullpen on three of the four sides, which provides an awesome vantage point for watching pitchers get warmed up. See what I mean? 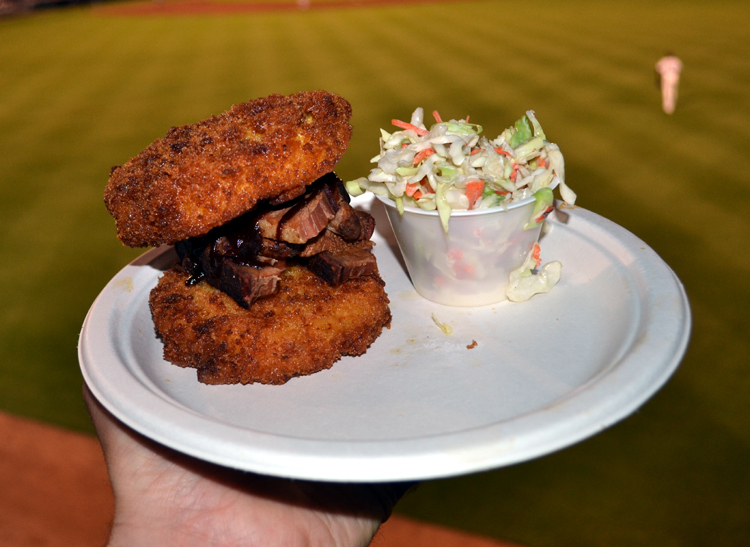 This memorable sandwich comes on a mac and cheese bun; allow me to explain. Take a hunk of mac and cheese, form it into a patty, cover it in bread crumbs and deep fry it — and you’ve got one half of a “bun.” Sound excessive? Sure does! You get a choice of meat, and I got smoked brisket. That meant that each bite had a nice crunch, the gooey deliciousness of the mac and cheese as the breading broke open and, of course, the tender smokiness of the brisket. It all made for a sandwich that was outstanding and truly original. 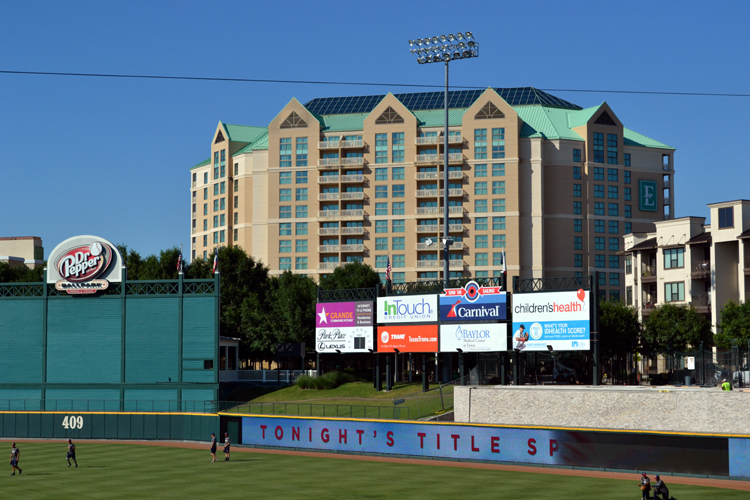 Then, midway through the ninth inning, I slipped out of the park and walked back to my hotel. 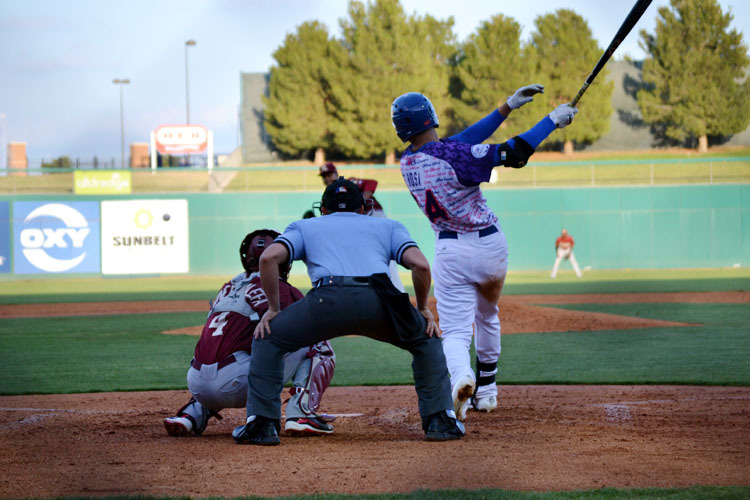 If you’ve followed my blog for a while, you’ll know that I don’t like to leave games early, but that I’ll do so if there’s a worthwhile reason, as I did when I visited El Paso. Well, I had a good reason on this night — I wanted to sit on my balcony for the Friday night fireworks show that would begin soon after the final out, rather than watch it from inside the park. 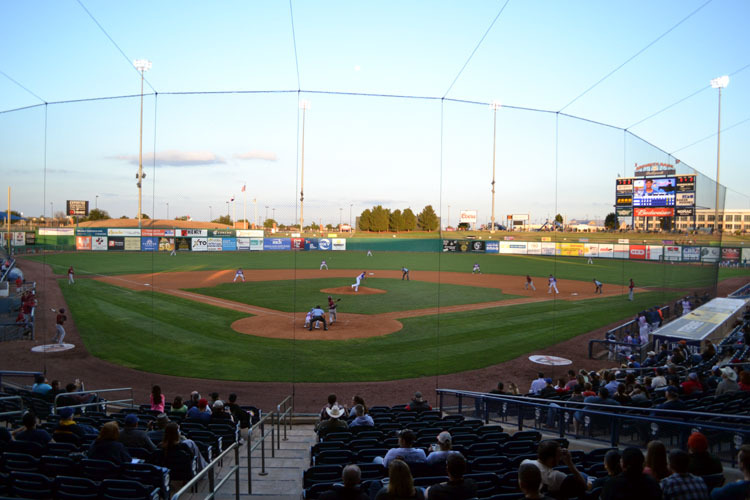 (The team has fireworks after Friday night games throughout the season and Sunday night games (during the summer) and one thing that is really neat is that fans can sit on the field to watch. 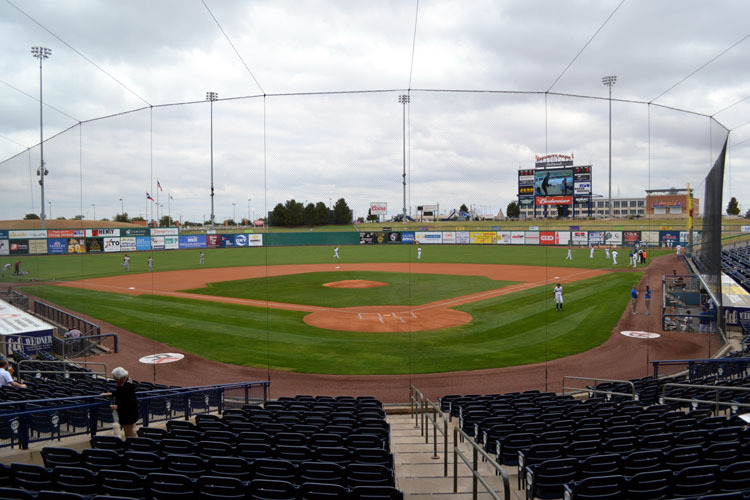 Following an awesome two-day visit to El Paso, it was time to hop back in my rental car and set my sights on Midland for the seventh and eighth days of my Texas road trip. The drive from El Paso to Midland is one that I’d been cautioned about by multiple people soon after I announced my trip — including a Twitter friend named Steven Ericson, who is a geography instructor and knows about such things. 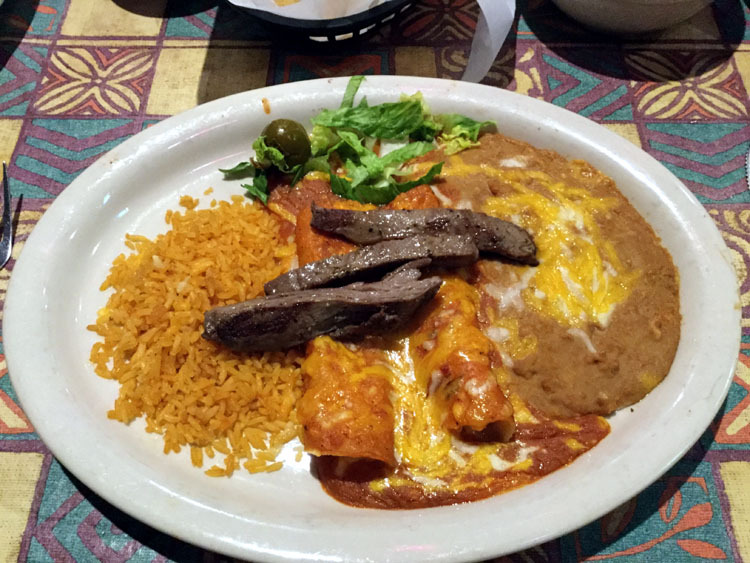 He strongly advised me to make sure that my car was full of gas before I left El Paso, given that there are long stretches without gas stations (and without much at all, to be honest) between the two cities. 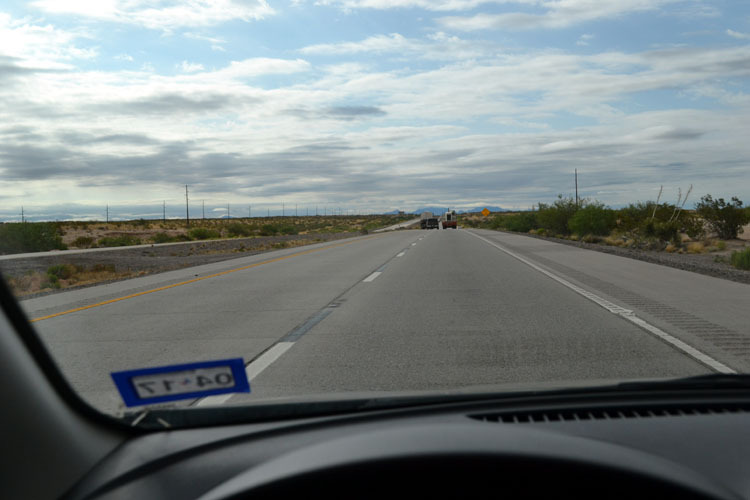 I heeded the advice, topped up my car and pulled out of El Paso about 7:30 a.m. on May 18. 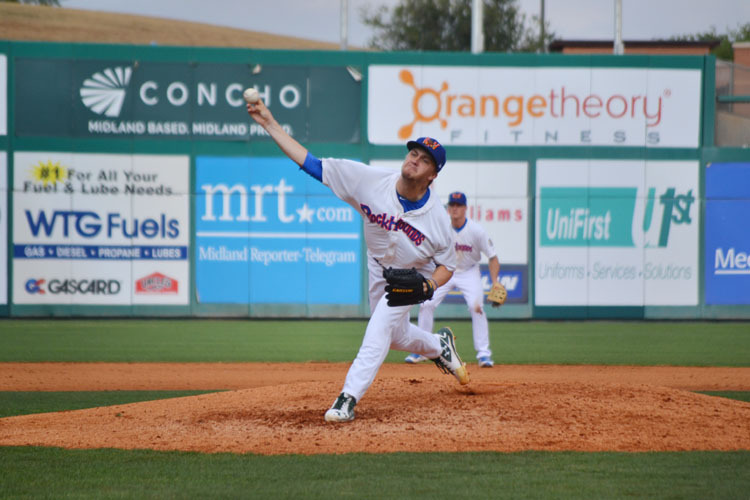 There was a Midland RockHounds game scheduled for that evening and, while the drive from El Paso to Midland is only about 4.5 hours, I’d be losing an hour due to a time zone change. 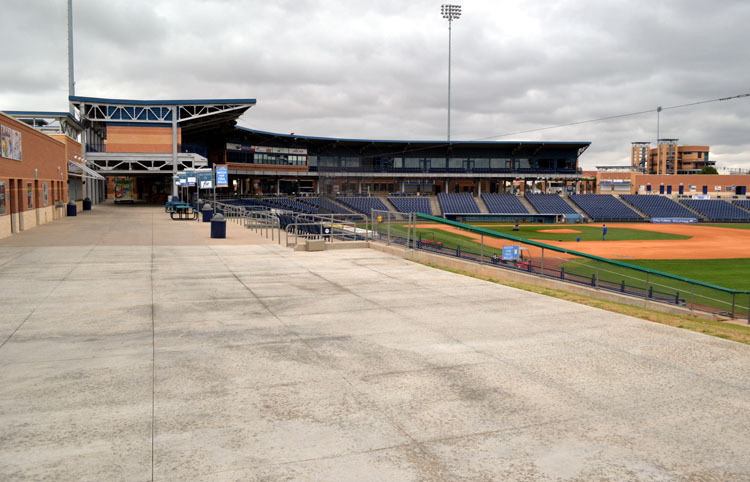 Plus, I was scheduled to meet with some folks from Visit Midland in the afternoon before the ballgame to tour the area a bit. Occasionally, I’d see a small town, so I’ll pull off and top up my gas. In one stop, my car would only take $5 to fill the remainder of the tank, which shows you that I wasn’t taking any chances! Someone told me there’s a stretch of about 80 miles without a gas station. I didn’t measure, but this doesn’t seem improbable. Eventually, the scenery around me began to change, and I was soon seeing pump jacks and flares on each side of the road for miles on end. Yep, I was definitely entering oil country. 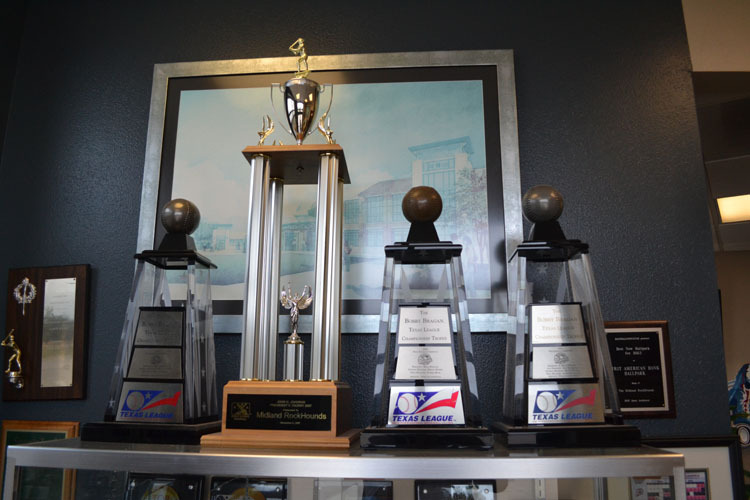 In addition to being the midway point between El Paso and Fort Worth, Midland is very well known for its oil. 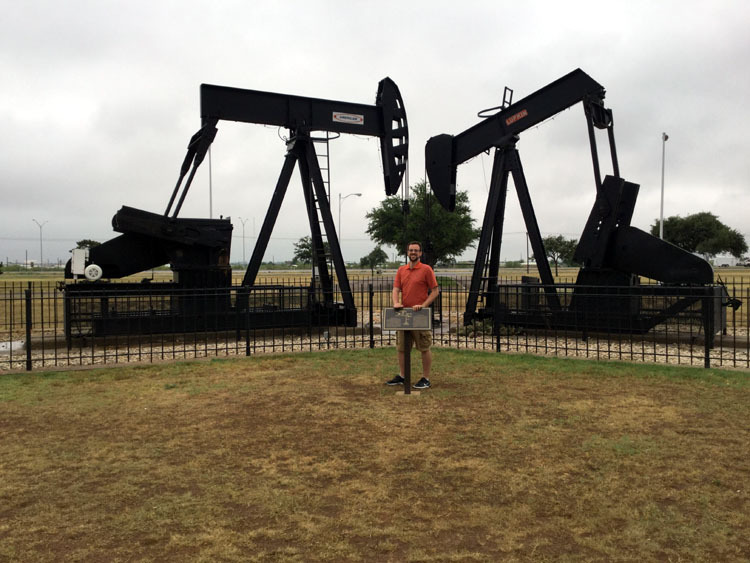 Oil was discovered in the Permian Basin in the 1920s, and the oil production has been going strong ever since. I’ve since read that today, this area produces around 20 percent of the country’s petroleum and natural gas. 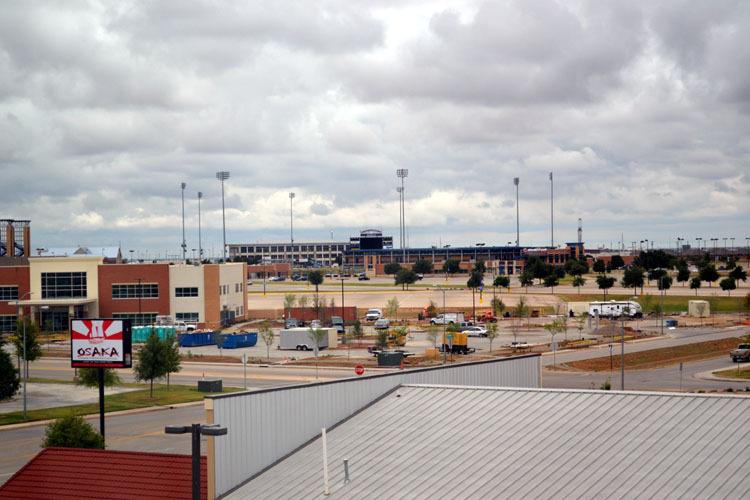 One more quick noteworthy fact about the area — if you’ve read the book “Friday Night Lights” or seen the movie or TV show of the same name, you’ll recognize the name of Permian High School. Well, it’s located in Odessa, which is just outside Midland. 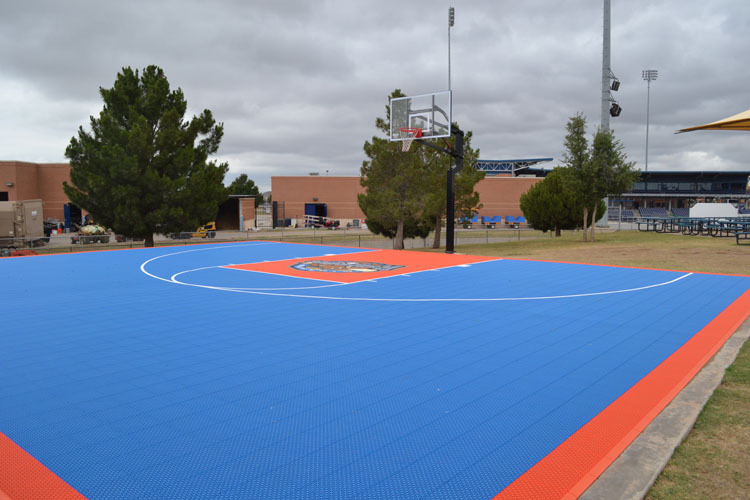 Or, you could say that Midland is just outside Odessa — there’s definitely a sports rivalry between the two cities! 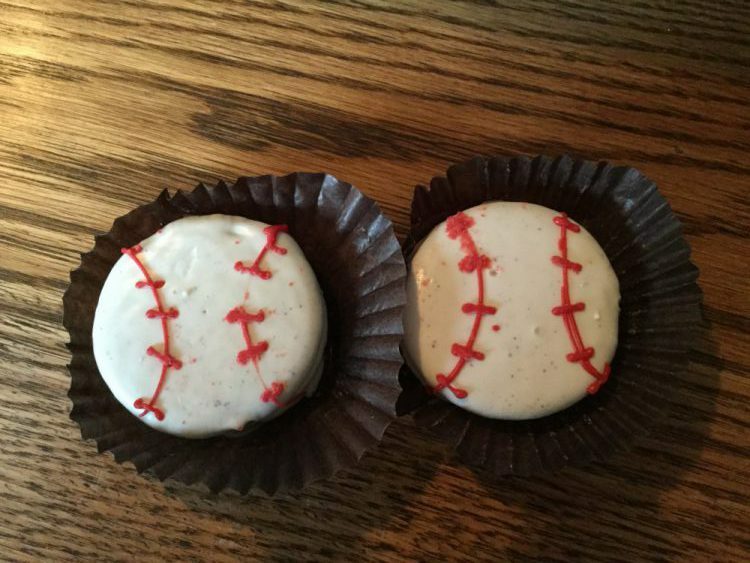 There were also treats from local vendors, including some white chocolate-covered Oreos with baseball stitching from a local candy store — and how Visit Midland knew that Oreos are my weakness is beyond me! Before making the short walk over to the ballpark, I thought I’d check to make sure that the game was still on. Though it wasn’t raining, the sky was definitely dark and rain was in the forecast. I looked on my Twitter to see if there were any updates about that night’s game and, to my disappointment, I read that it had been postponed due to the weather. There was good news, though — there’d be a doubleheader the next day. 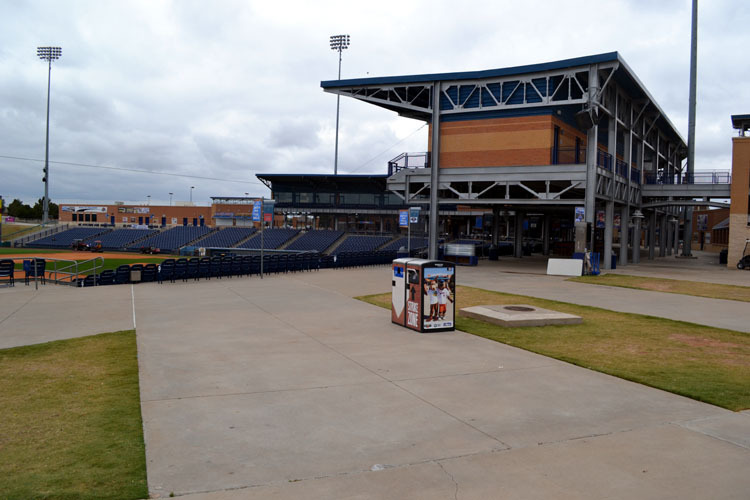 Lyndsey dropped me back off at the hotel shortly after 2 p.m. and I immediately headed out for the short walk to Security Bank Ballpark. 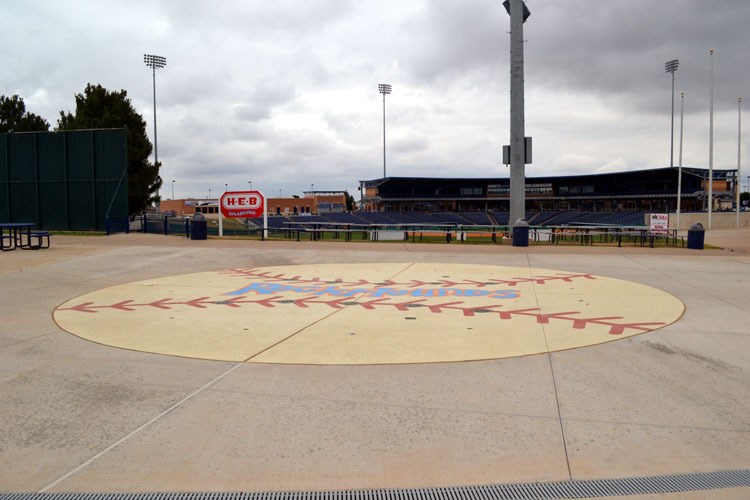 I figured that the crowd would be pretty sparse for the early innings of the first game, as is often the case with doubleheaders, but I still wanted to get to the park good and early to tour around, take lots of photos and shoot some video with my GoPro. 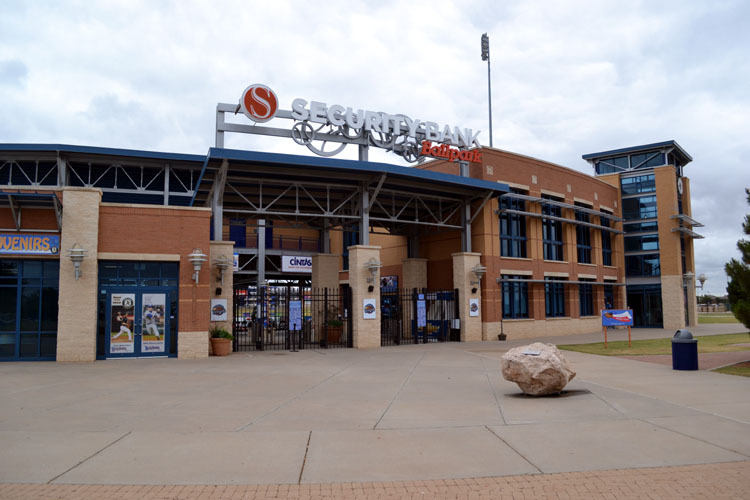 Although I’m always excited when I approach a ballpark, this one had an extra-special feel, as it was the 50th different Minor League Baseball park I’ve visited since 2010. By the way, if you want to see everywhere I’ve been, it’s all at this link. I grabbed it and gave it to a kid soon after the gates opened a while later. Don’t get me wrong, there were lots of staffers running around getting ready for the game, but there were occasional pockets of time in which I was really the only person in the area — and that was awesome. 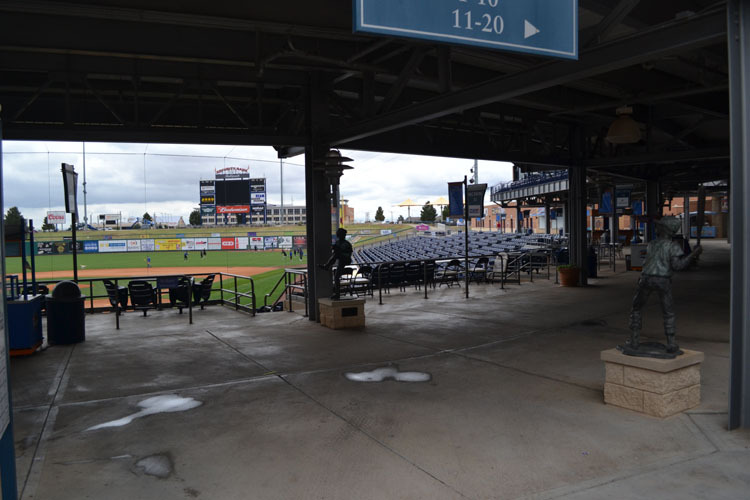 It’s always such a treat to get to wander around an empty ballpark; it’s hard to explain, but it’s a feeling that I really enjoy when I get to experience. 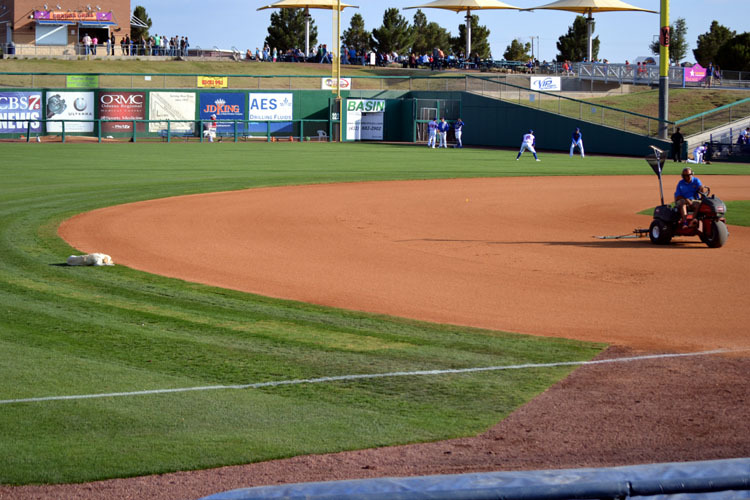 Did you notice the big hill in left field? This picture should hopefully put its size into perspective. 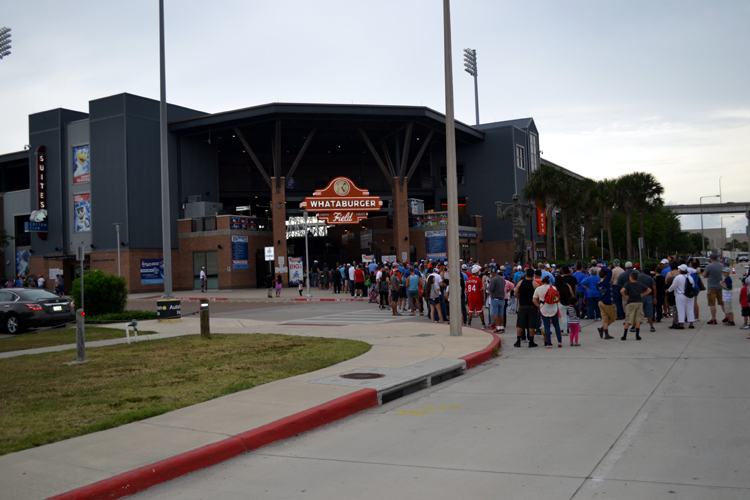 As I suspected, the crowds weren’t exactly flooding into Security Bank Ballpark right away. 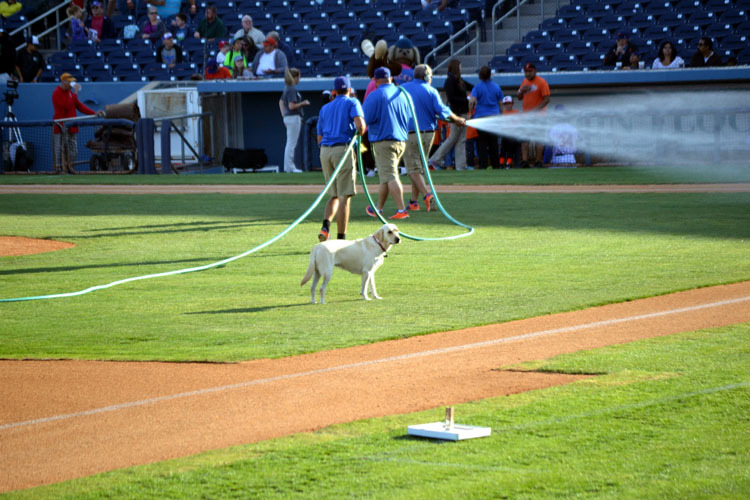 But, I suspected that by midway through the first game, the park would be hopping — and that was indeed the case, thanks in part to the team’s Thirsty Thursday promotion that began after the conclusion of Game #1. I was positively giddy about the initial emptiness, thinking that I’d have an excellent chance of snagging a foul ball or two. In fact, I even sent out a tweet jokingly wondering how many foul balls I’d end up with. Well, the answer was a little humbling. Despite hanging out in a great area — I sat in the top row of right near that wide concourse that you saw a few photos earlier — no balls came even close to me. I had easy access to a couple seating sections, as well as the wide concourse behind me and down to the corner, and there wasn’t a single ball hit anywhere near that area in the first few innings. 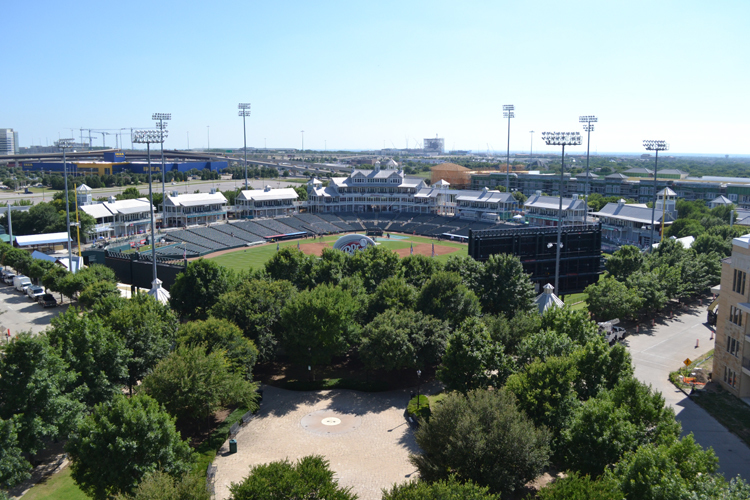 I suppose that if I’d stayed, my luck might have changed, but I never like to sit in one single area for too long, so I soon headed off to enjoy the ballpark from different areas. Now, they weren’t home run balls, nor were they hit during BP. They were both sitting on the grass berm when I arrived, and were soaking wet. They hadn’t been there earlier, so I’m certain they were found in a bullpen by a pitcher and simply tossed up onto the grass for a fan to find. 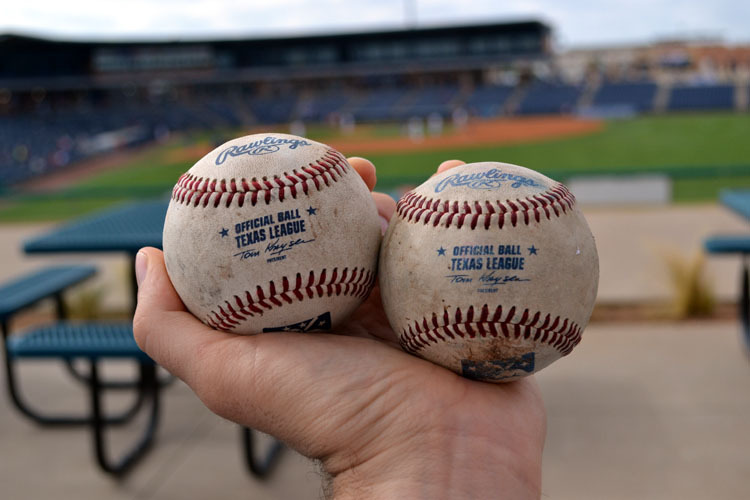 Since I was the only fan in the area, I was happy to add two more Texas League balls to my collection. In fairness, I think it could’ve afforded more peanut butter and jelly, as I found they got a little lost behind the strong flavor of the bacon and the hot dog itself. I was impressed with the solid amount of bacon, though, and I think I may try to recreate one of these hot dogs at home sometime. 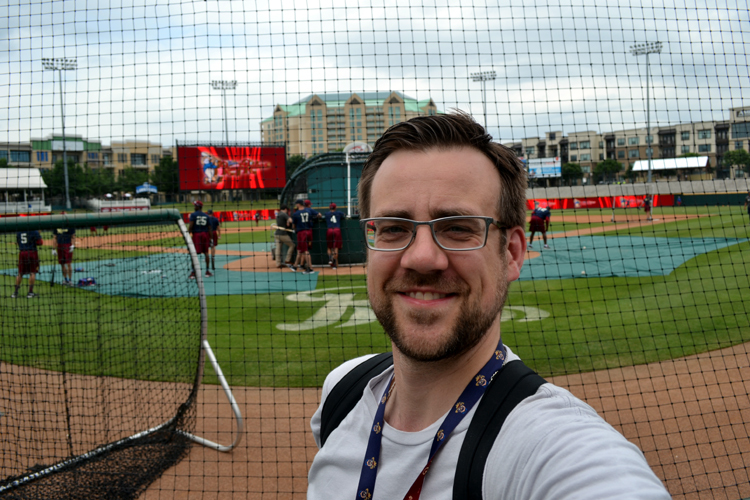 For the remainder of the game, I took a few more laps around the concourse, shot a bit of video with my GoPro and, in general, just enjoyed a laid-back night at the ballpark. Midland first baseman Viosergy Rosa has just made contact, and you can see the ball against the outfield fence. 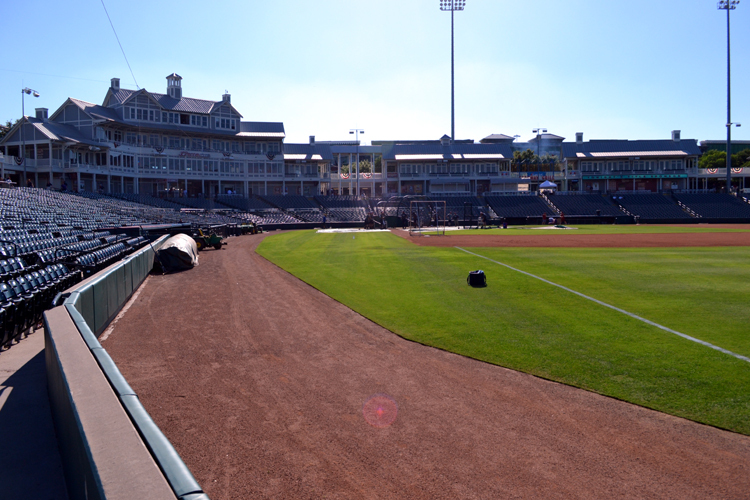 Great looking view from home plate, right? … and then went back inside to watch the last couple innings from my earlier seat behind home plate and just enjoy the game and the park. 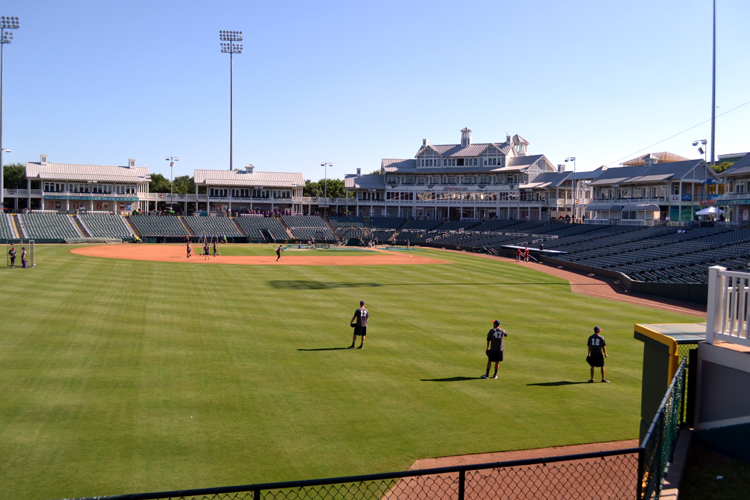 It was too bad I didn’t get to experience two days at Security Bank Ballpark, but I’m glad that the doubleheader allowed me to spend lots of time at this Texas League facility — and the other things that I was able to experience in Midland certainly made this a memorable stop on my Texas trip. Hopefully I’ll be able to visit again soon. When the game wrapped up, I had just a quick walk back to my hotel where I’d relax for a few hours and then go to bed knowing that I’d be up in the morning to drive to Frisco for the last two days of my Texas trip. 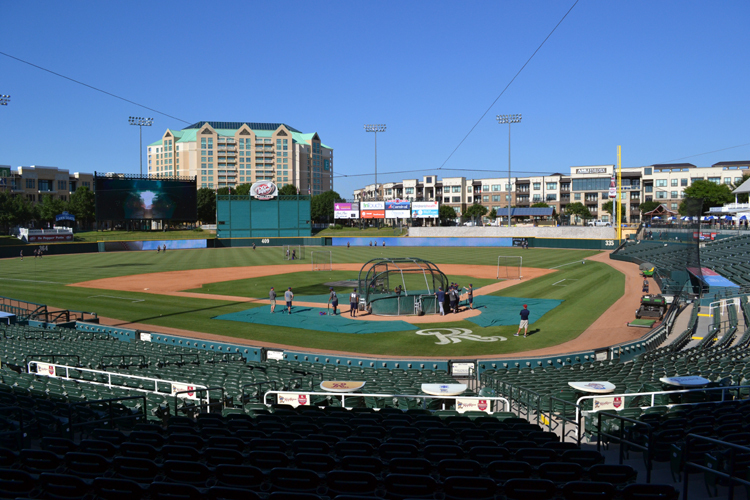 My 10-day visit to Texas started off on an extremely high note with two outstanding days in Round Rock. 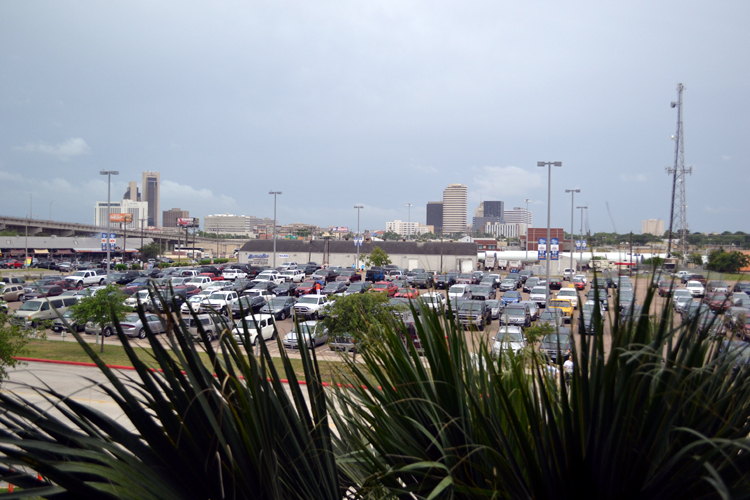 While I was sad to bid farewell to that city, I was excited to get up on the morning of Saturday, May 14 and set my sights on Corpus Christi. 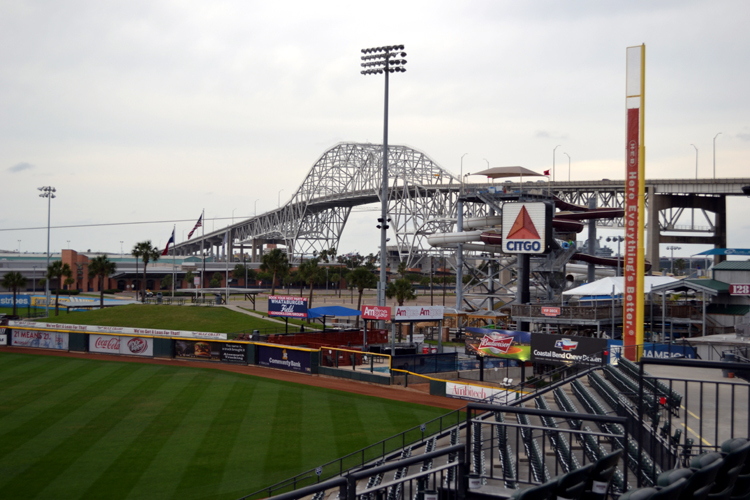 The city sits right on the edge of the Gulf of Mexico, so I was pumped to enjoy a different sort of climate for a pair of visits to Whataburger Field, home of the Corpus Christi Hooks, over the next two days. 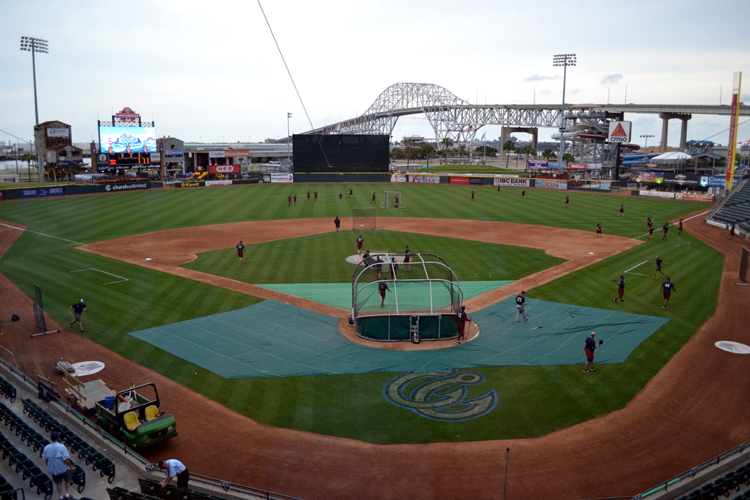 It takes about 3.5 hours to drive from Round Rock to Corpus Christi, but I checked out of my hotel early in the morning so that I could get to Corpus in good time and play tourist for a bit before seeing the Hooks in action that evening. 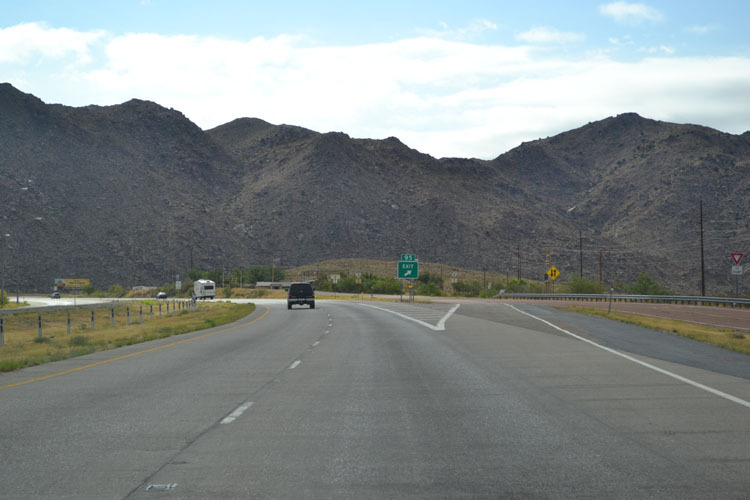 The drive between the two cities was interesting because it featured more ranches than I could’ve counted; there was no doubt that I was in Texas, and I was sure enjoying the scenery. Soon enough, though, the scenery changed. 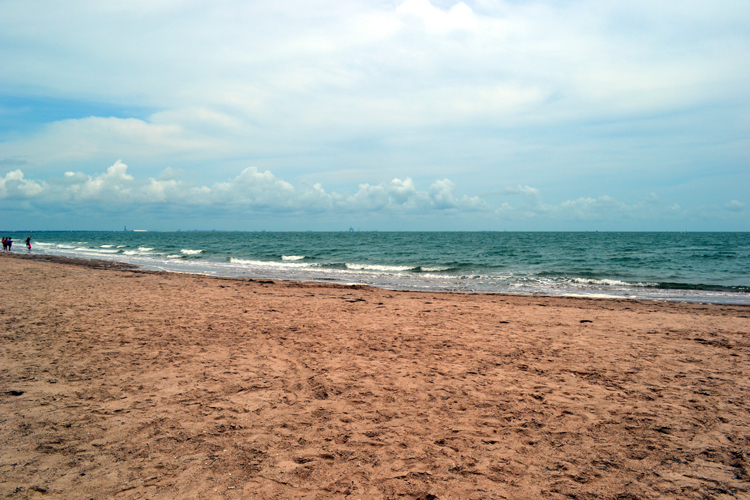 The small towns and big ranches gave way to the sight of the Gulf, the distinct smell of sea air and the call of seabirds. 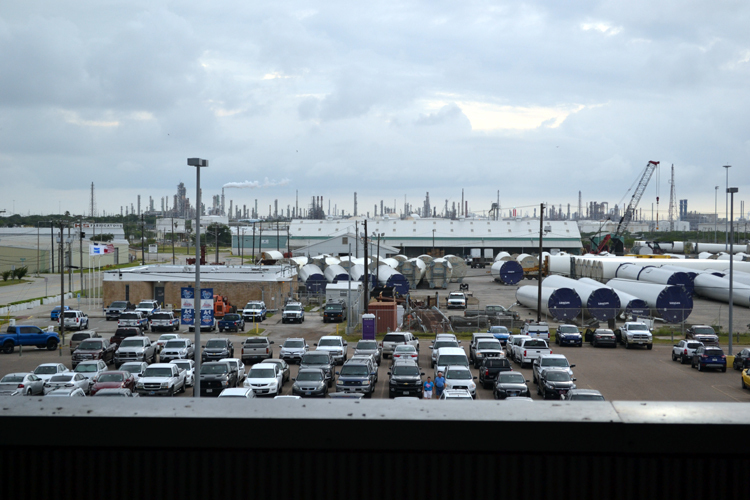 I couldn’t help but roll down my windows as I breezed into Corpus Christi to take it all in. That’s the U.S.S. 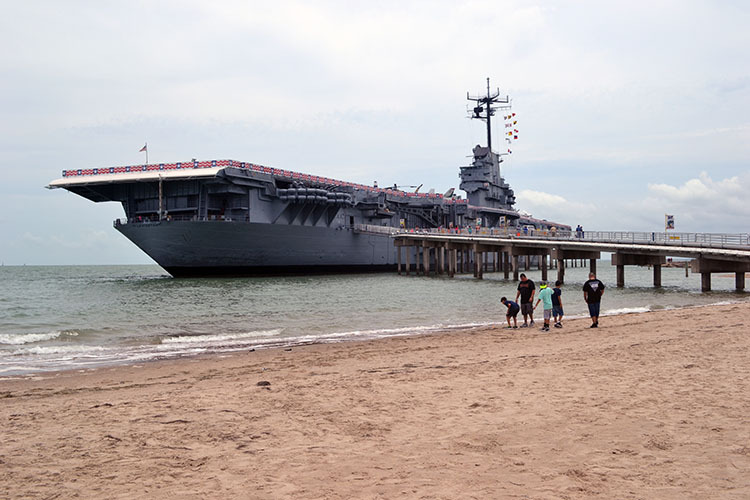 Lexington, an aircraft carrier that now serves as a museum ship. I’m a big military history buff, so I knew I wanted to spend some time at the “Lady Lex,” as it’s called, from the time that I started planning this trip. 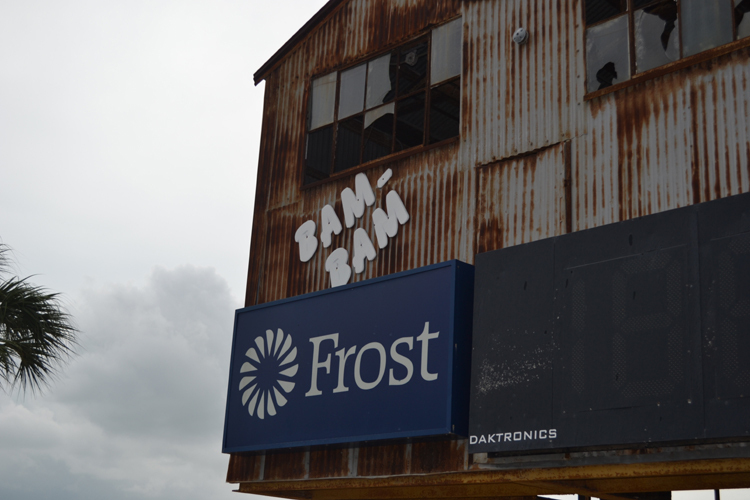 I’ll have details and lots of pictures from my tour in an upcoming blog post. 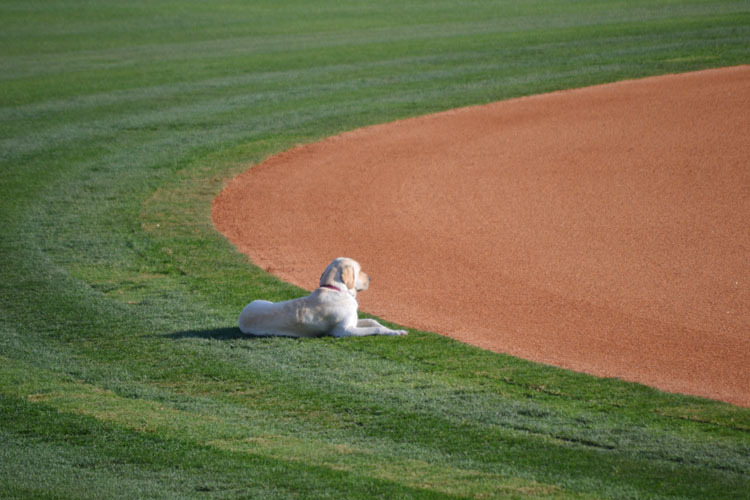 This post, from here on out, is all about baseball. After spending a couple hours on the aircraft carrier, I checked into my hotel downtown and got ready for the game. 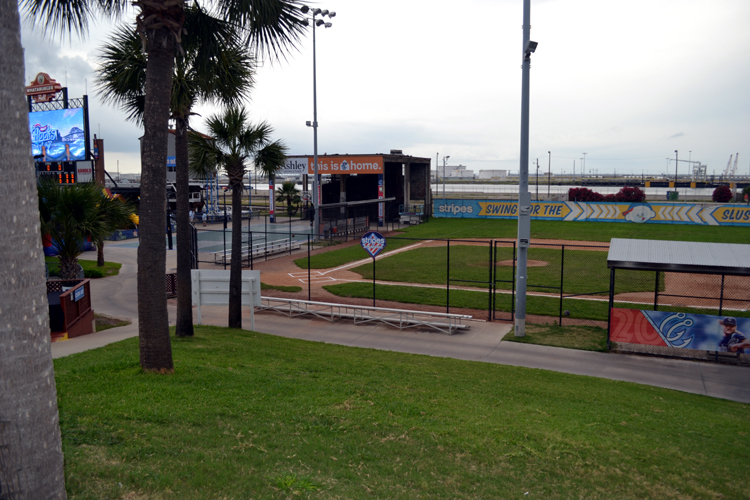 While I could’ve walked just over a mile to Whataburger Field, I opted to drive because I read that inclement weather can occur quickly in Corpus Christi (more on that in my next post) and I didn’t want to be caught walking a mile in the rain like a fool. 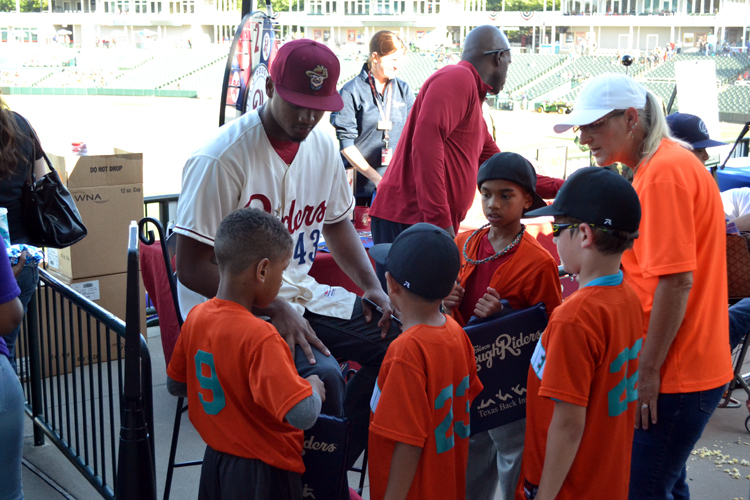 The early crowds were a sure sign of a sought-after giveaway, and that was definitely the case here — the Hooks were giving away replica jerseys to the first 1,750 fans. Fortunately, I didn’t have to worry about the lines; just a few minutes after arriving, I met up with Matt Rogers, the team’s director of communications, and got my media pass. I figured I’d get my pass and start wandering around to check out the ballpark before the gates opened, but Matt asked if I wanted a tour, and of course I accepted. 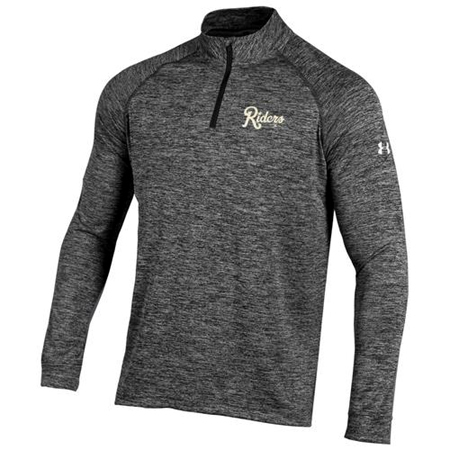 Outstanding, right? That’s the Harbor Bridge in the background, which I think provides an awesome backdrop. 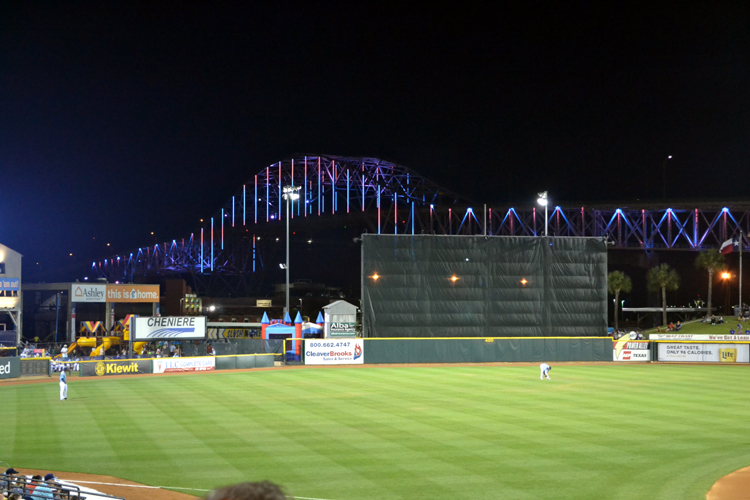 I always get a kick out of seeing big bridges on my trips and driving over them, so the thought of sitting behind home plate with a beautiful bridge in the background was enticing. 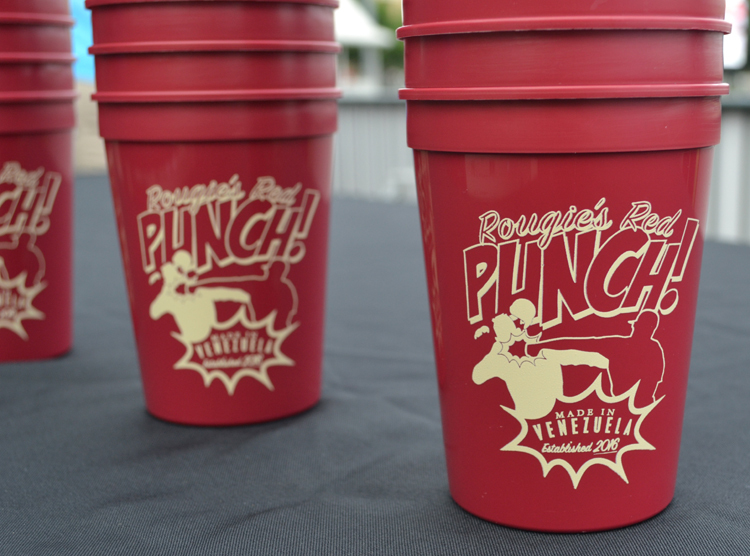 There are a couple other notable features to mention. 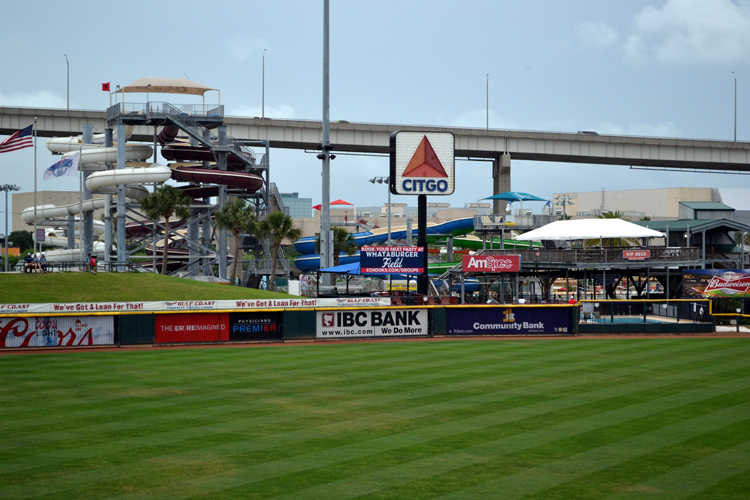 See the Citgo sign in right-center field? 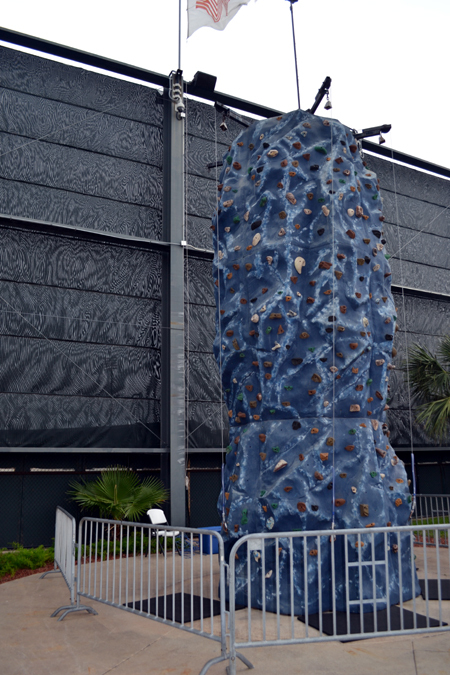 Well, right behind it, you’ll see a tall structure. 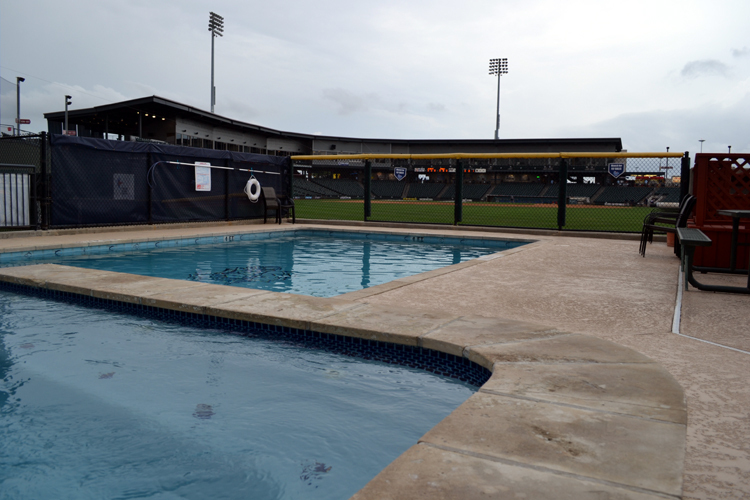 That’s part of Hurricane Alley, which is a big waterpark directly behind the ballpark. 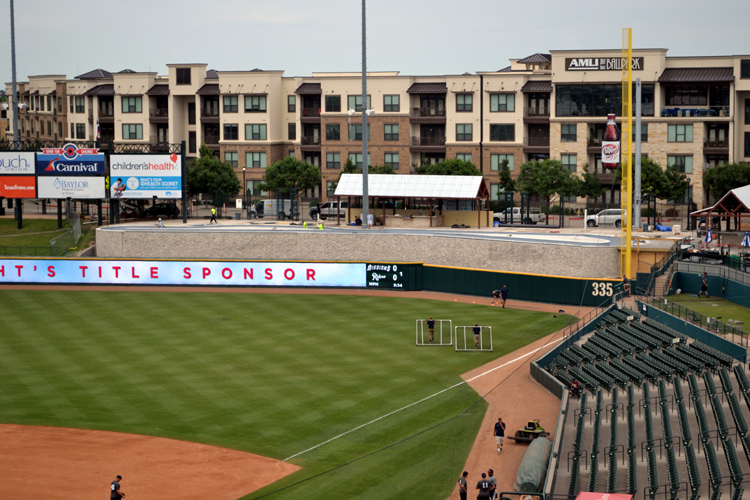 The other feature that I want to point out is behind the video board in left field. It’s hard to see in this picture, but do you notice a body of water? That’s a canal/turning basin that enormous vessels travel through. 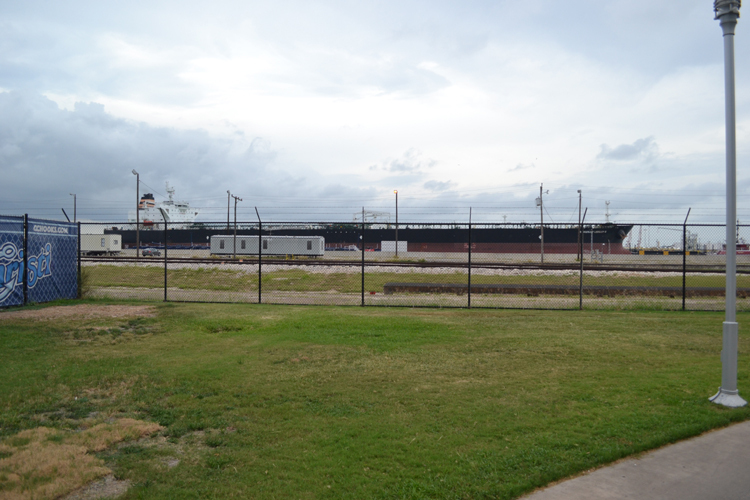 A huge Citgo refinery is located out of sight to the left, so oceangoing vessels come in from the Gulf, travel under the bridge, pick up whatever they’re picking up at the Citgo docks and then turn around and head out to the ocean. If you stand on the grass berm in left field, I later noticed, you can watch the ships pass from just a short distance away. 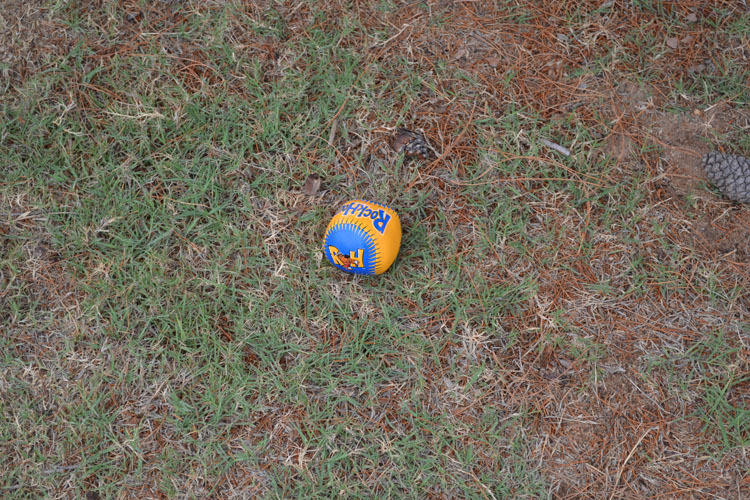 I snapped the above photo of the ball but didn’t pick it up since the gates weren’t yet open. Argh. 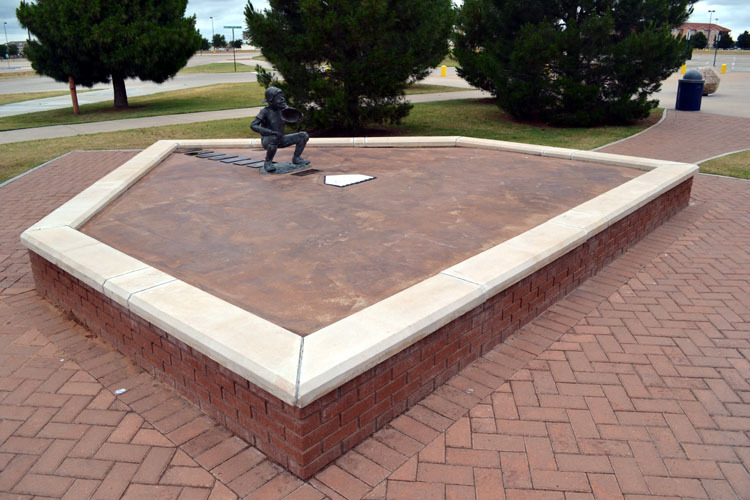 I love minor league parks that really make the bullpens accessible to fans, so after being impressed with the bullpen locations in Round Rock over the previous two days, I was excited to see a high degree of accessibility here, too. 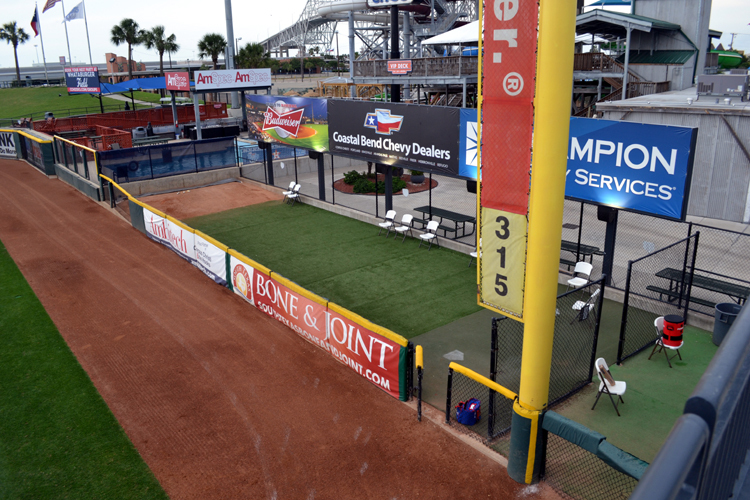 Check out the picnic tables on the concourses behind the ‘pen. 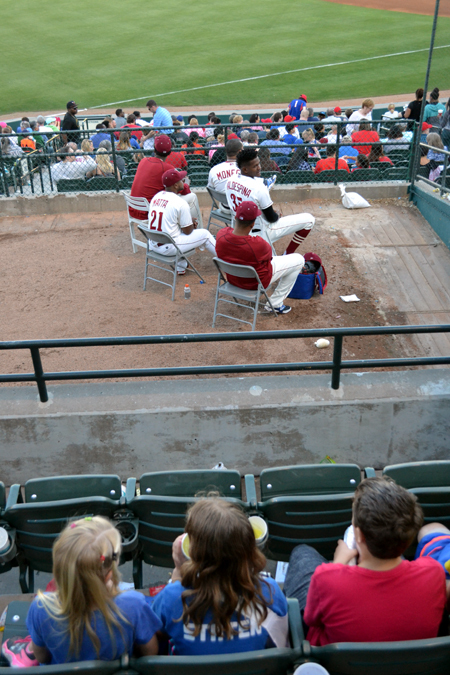 You can sit just a couple feet behind the relievers, which I think is really cool. 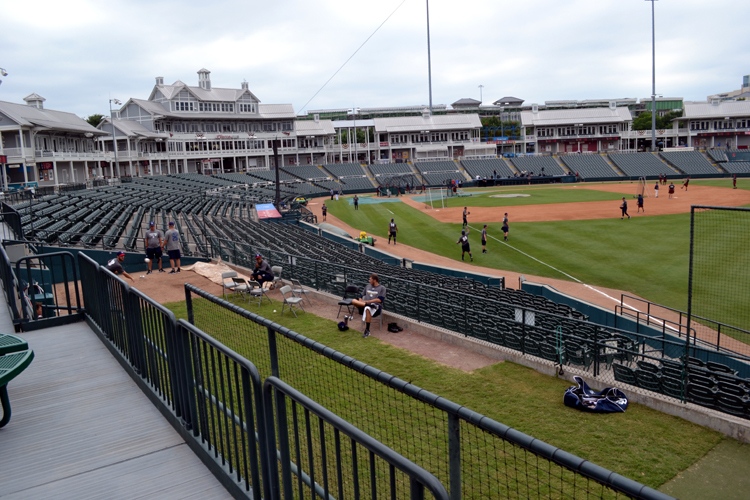 I love the location of the rocking chairs because they’re directly behind the outfield fence. 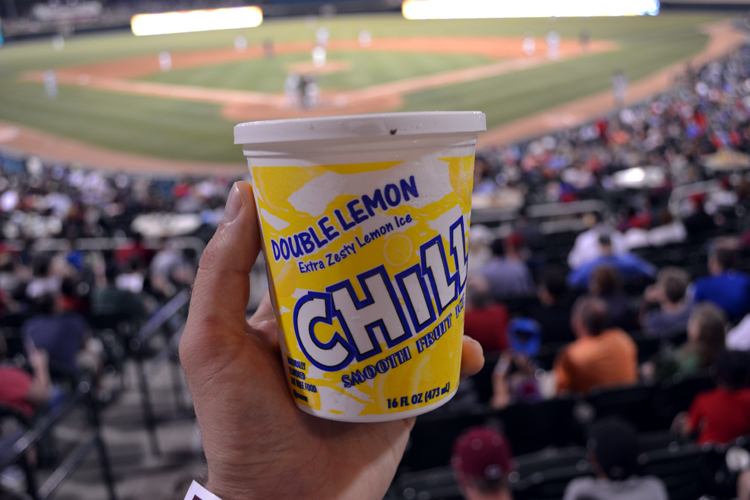 Imagine wearing your glove as you enjoy the comfy seating, and then standing up to catch a home run ball? Awesome. 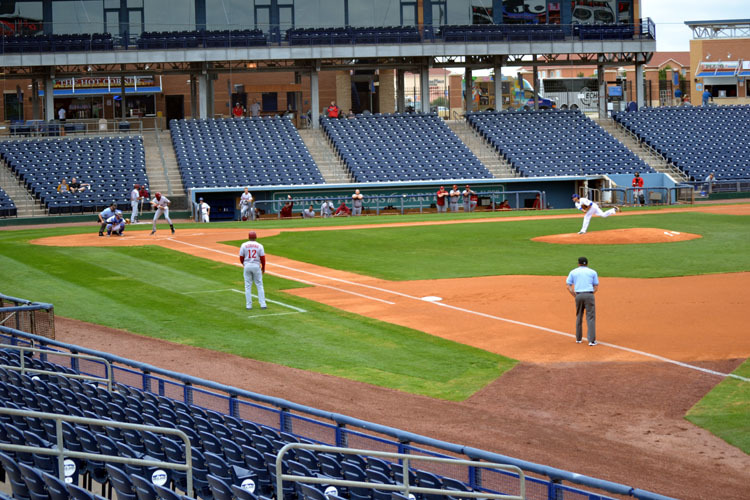 The premise is that youth teams can schedule a game in the early evening and then walk right into the MiLB ballpark after their game wraps up and watch the professionals play. It’s a great idea and something that more teams should do, I think. 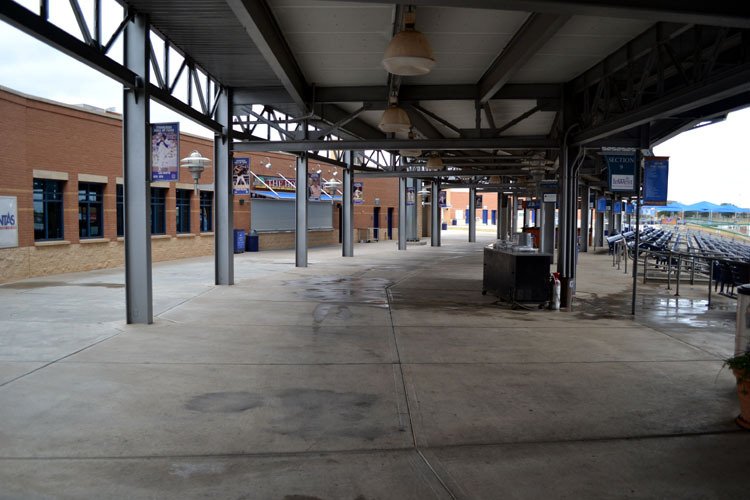 We continued making our way around the concourse until we were back at home plate, at which time Matt had to get back to work. 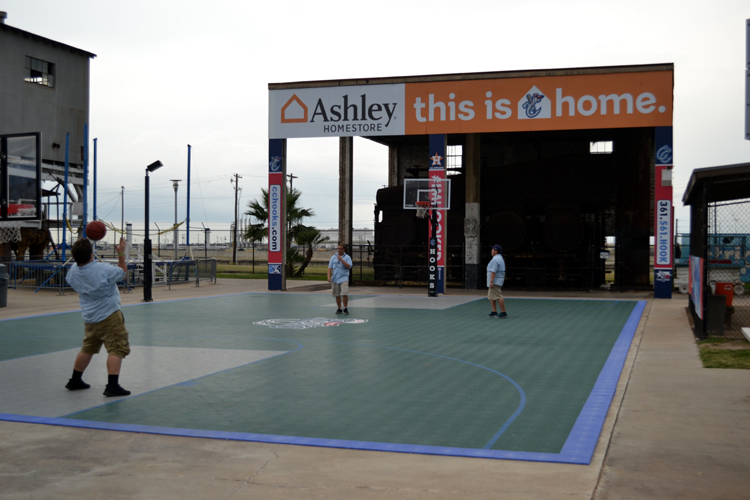 As I stood there contemplating my next move, I suddenly thought about the ball that I’d seen earlier. By now, I figured that any of the ushers in the area would’ve grabbed it — and, besides, the gates were now open, which meant a fan could’ve picked it up, too. 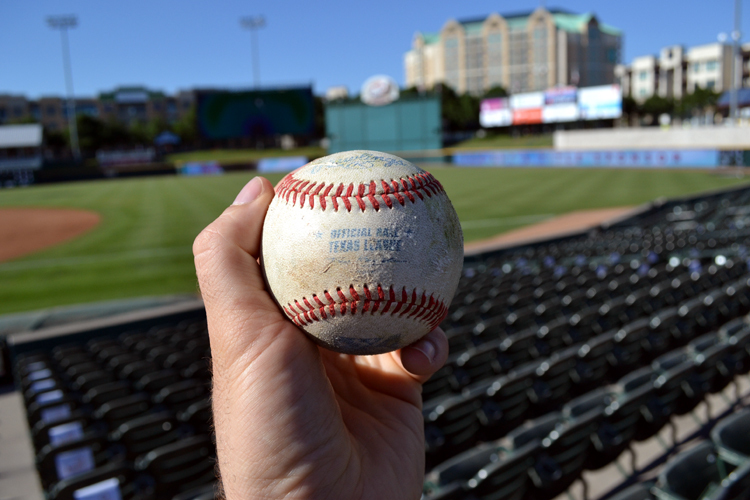 For the heck of it, I hustled down the first base concourse and, to my amazement, the ball was still sitting in its place! 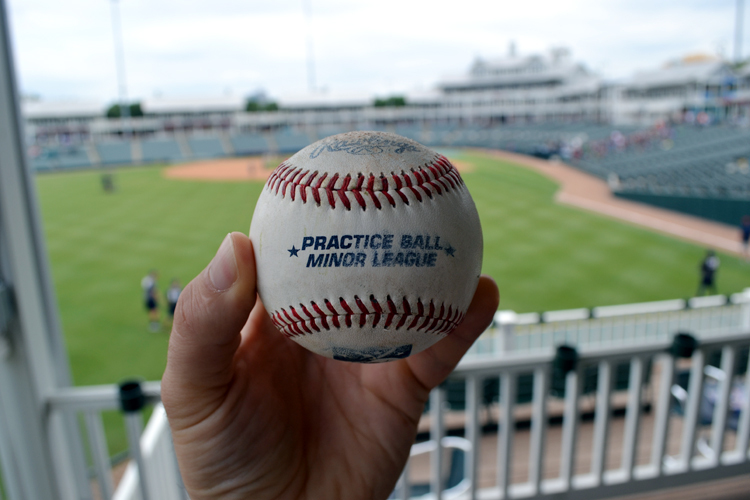 My next stop was the batting cages down behind the third base line, where I watched a couple members of the Hooks working on their swings. 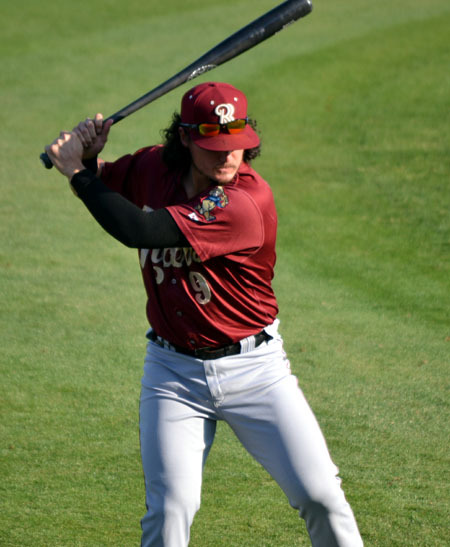 I don’t have any photos of this, though — even though I was standing just a few feet away, I was shooting through a chain-link fence and two separate sections of netting, so my camera didn’t feel like cooperating. 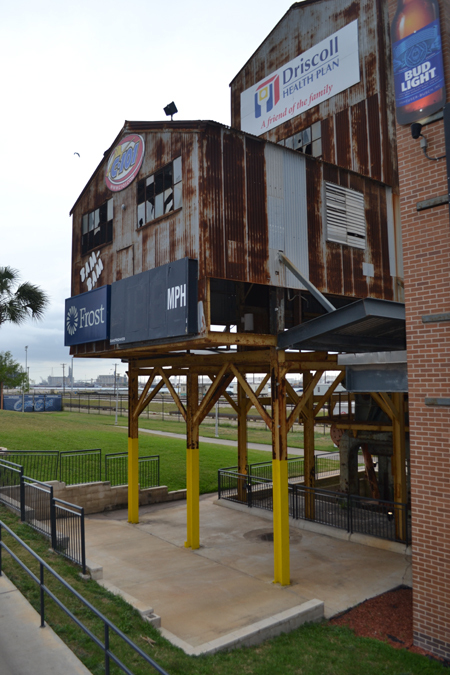 Still, this is a cool area that is definitely worth checking out during your visit to Whataburger Field. I made a point of Googling the name of the tanker and, as I write this, it’s about to enter the Strait of Gibraltar! By the way, see all those white and blue cylindrical devices in the foreground? Those are wind turbine pieces. 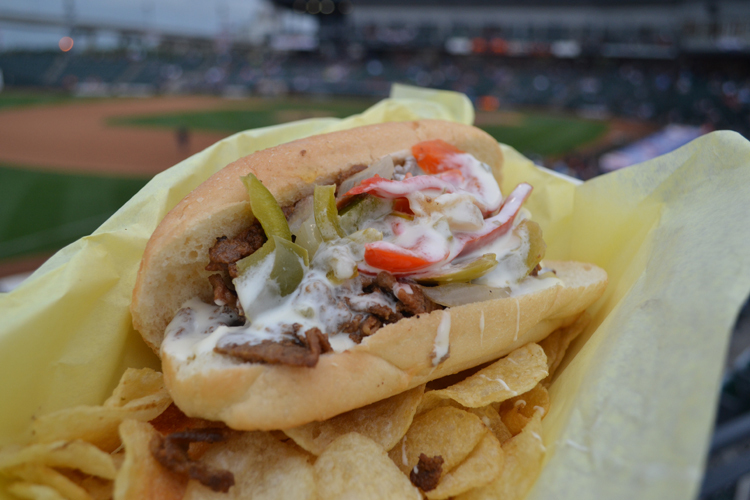 I’m not sure what made it “Texas style,” but the steak and the peppers and onions were yummy. As you’ve maybe heard me rant before, I’m not a fan of the ballpark cheese goo, but I otherwise enjoyed this big sandwich and the potato chips it came with. 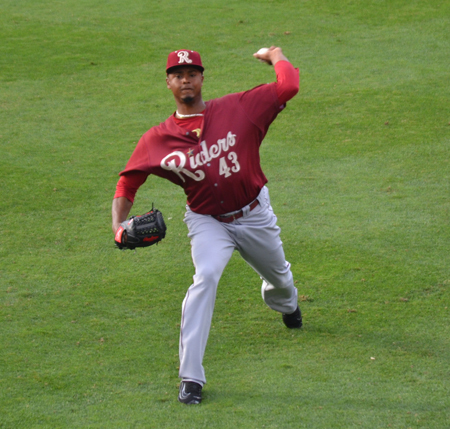 When Payano and Deglan moved into the bullpen, I took a spot on the stairs above the catcher, where I had a straight-on view of Payano warming up. As much as I probably would’ve enjoyed staying in that seat for the remainder of the game, I wanted to watch Evan Gattis’ at-bats from the grass berm beyond left field. 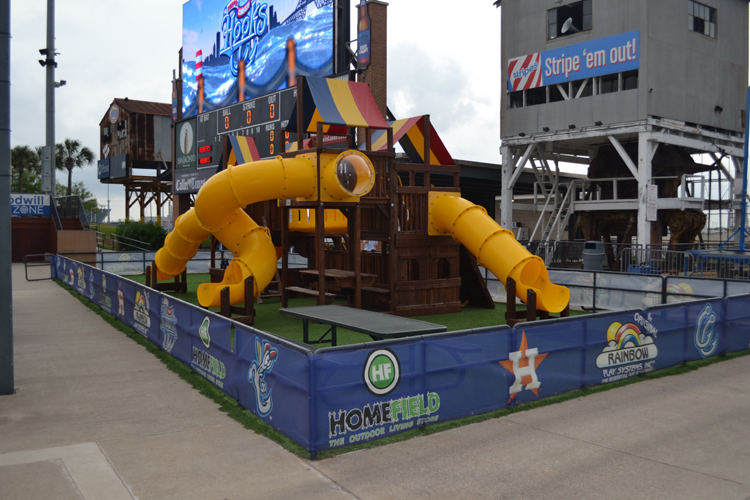 The Hooks/Astros slugger, of course, is known for his towering blasts, and I figured that if he hit one onto the berm, I’d have a really good chance of snagging it. 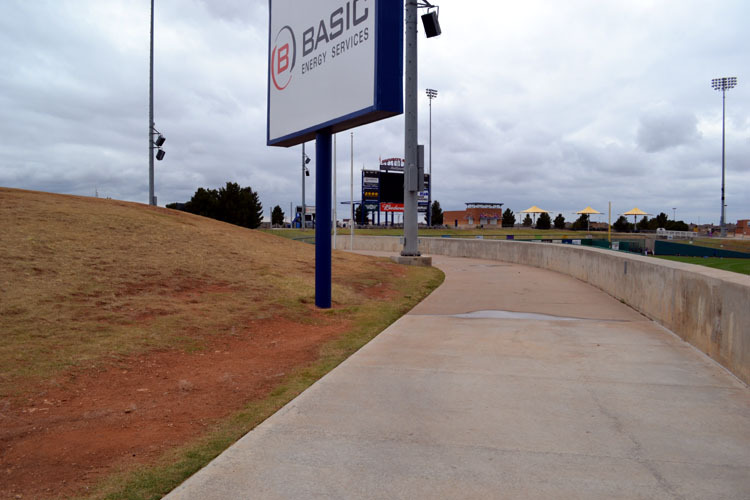 I made sure to be on the berm for Gattis’ next two at-bats of the game, but he didn’t send anything my way. Ho-hum. 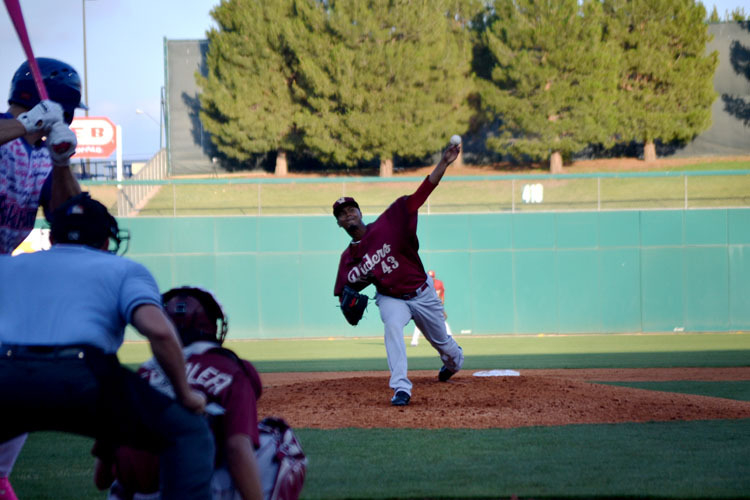 I split as soon as the final out was recorded, hopped in my car and was back in my hotel room just a few minutes later for some much-needed rest. 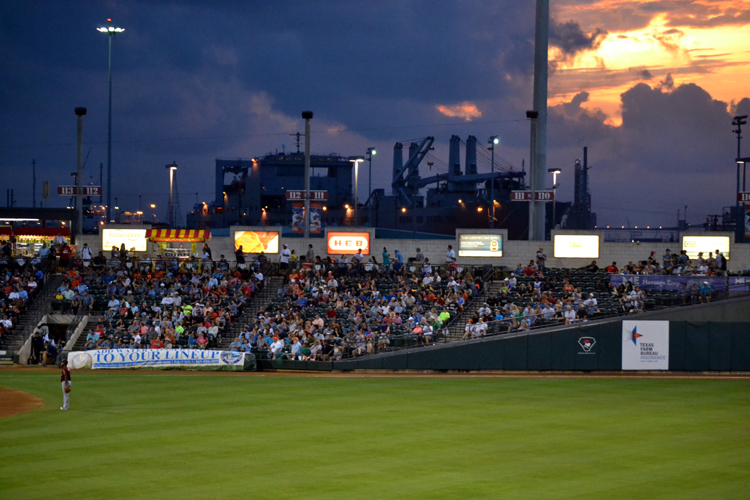 I’d be back at Whataburger Field in a little over 12 hours.